As archival and special collections resources become increasingly available in digital environments, our need to understand these documents in the context of their original material forms remains. As a result, techniques for teaching primary source literacy are a topic of rich discussion in special collections, archives, and library institutions, especially as information professionals consider ways to expand both research and readership. In light of the significant focus on undergraduate populations in many case studies on special collections pedagogy, this article discusses a year-long pilot program titled “The Collaborative Research Seminar on Archives and Special Collections” between the Graduate Center, CUNY, and the New York Public Library. To frame this interdisciplinary graduate seminar, which addressed both the theory and praxis of primary source research, I first discuss pedagogical frameworks, including Jacques Rancière’s critique of explication and Paulo Freire’s “banking model,” alongside Adrienne Rich’s teaching notes from her time at CUNY and Patrick Williams’ work on embodiment and archives. I then explore participant responses that address imagination, experimentation, and identification in the reading room—especially after the methods of Lost & Found: The CUNY Poetics Document Initiative, a key contributor to this program. By enumerating the practices that informed and constituted the Seminar, I suggest that we might consider conversation, experience, and experimentation as fundamental values in special collections pedagogy. As we envision the digital futures of books, manuscripts, and archives, there is no substitute for historicization: books and manuscripts are technologies too, and foregrounding this perspective allows us to contextualize our work with digital facsimiles, metadata, and resources. This conversation far predates our current moment of digital profusion; in Orality and Literacy (1982), Walter J. Ong compares Plato’s critique of writing to contemporaneous critiques of computation, noting that “once the word is technologized, there is no effective way to criticize what technology has done with it without the aid of the highest technology available.” Ong continues, arguing that this technology is not “merely used to convey the critique” but rather brings “the critique into existence” (78). To corroborate this: when we explore the implications of our material history, our work increasingly, though not exclusively, occurs within or alongside digital context. We write about rare and archival materials in digital spaces, create digital repositories of items, and use digital methods to analyze documents, from transcription services to x-ray spectroscopy. Yet handling, working with, and conceptualizing primary source materials are skills that can be gained through a combination of experience and instruction. Forms of digital access to these items do not circumvent the need for these skills, but only expand their value. While there are decades of research on the concept of information literacy, the idea of “primary source literacy” is relatively nascent both as a professional term and as a template for specific pedagogical strategies (Carini 2016, 191). Elizabeth Yakel and Deborah Torres’ “AI: Archival Intelligence and User Expertise” (2003) posits an influential three-part standard: domain or subject-focused knowledge, artifactual literacy, and the idea of “archival intelligence,” which consists of understanding archival theory and practices, negotiating strategies to handle the ambiguity of primary sources, and creating meaning from the artifactual or material qualities of a source. In addition, professional organizations for libraries such as the Society of American Archivists (SAA), the Association of College and Research Libraries (ACRL) and ACRL’s Rare Books and Manuscripts Section (RBMS) have formed a “Joint Task Force on Primary Source Literacy” (2015), whose guidelines have been approved as of 2018. These guidelines, which consolidate decades of work among information professionals in these organizations, attest to the growing importance of quantifying and understanding the ways in which we teach within special collections, archives, and libraries. Today, teaching techniques that animate these guidelines are most visible in case studies or digital toolkits (such as Brooklyn Historical Society’s “Teach Archives” in 2013), designed to illuminate the pedagogy of specific institutions, as well as the Society of American Archivists’ recent publication series, “Case Studies on Teaching with Primary Sources (TWPS)” (2018), which animates the “Guidelines for Primary Source Literacy” by the same organization. These resources are often extensive, such as Using Primary Sources: Hands-On Instructional Exercises (Bahde, Smedberg, and Taormina 2014), a text designed to share both activities and types of learning goals across a range of collections and populations (vii). These techniques and examples often emphasize hands-on, lesson-based learning, as opposed to presentations or “show-and-tells” that exhibit materials but do not provide instruction on how to analyze them or access them in the context of a research visit. As embodied by Past or Portal? : Enhancing Undergraduate Learning through Special Collections and Archives (Mitchell, Seiden, and Taraba 2012), the increasing volume of specific case studies across materials and institutions contributes to the robust conversation on pedagogy in special collections, particularly at the undergraduate level. However, beyond resources such as the Council on Library and Information Resources (CLIR) report, Terra Cognita: Graduate Students in the Archives (2016), which surveys the findings of the CLIR Mellon Fellowships for Dissertation Research in Original Sources, few resources or literature exists for teaching primary source literacy to graduate populations, especially in a multidisciplinary context. At the graduate level, students often seek basic training that echoes aspects of Yakel and Torres’ (2003) idea of primary source literacy and includes negotiating materials in special collections and archives, navigating catalogs and finding aids that are primarily hosted in digital spaces, and managing information and notes once in the reading room. The types of questions that accompany graduate-level primary source literacy align with Yakel and Torres’ concept of “archival intelligence,” and are enumerated in the CLIR report Terra Cognita (2016): “Navigating Institutions,” “Negotiating Expectations,” “Documenting Processes,” and “Finding What You Need”—all essential aspects of archival research that involve technical knowledge, critical thinking, project management, and interpersonal skills. However, particularly in fields with a strong theoretical component, or in programs that require teaching, graduate students are also often primed for conversations not just on resources or skill development but also on special collections pedagogy itself. Special collections-based classes with graduate students are not just an opportunity to impart skills or information, but to critically examine “the archive” as a theoretical, conceptual, and literal space. As a result of the so-called “archival turn” in literary studies, for instance, sparked in part by Jacques Derrida’s Archive Fever: A Freudian Impression (1995), the idea of the archive, which graduate students often theorize in their work, may have little in common with an institution they visit to conduct research that is staffed by humans (not theories), with unique management and custodial procedures, reflecting a history all its own. In particular, scholars and archivists have different stakes in their definitions of what constitutes an archive or special collection, and how these sites signify critically, conceptually, and literally. By speaking across these disciplinary boundaries, we can more equitably offer credit and share responsibilities for making the material traces of history visible and accessible to those who need them. And given the critical possibilities of this interaction, special collections pedagogy stands to benefit from a model in which knowledge of primary source work is not just transmitted, but actively co-created with a highly proficient and critically engaged population. To frame key features of critical pedagogy specifically for work in special collections, we might consider the standard “show-and-tell” class visit, in which a librarian or curator imparts information about objects on display, as an example of Paulo Freire’s “banking model” of education from his canonical Pedagogy of the Oppressed (1970). In this model, knowledge is “bestowed” by those in possession of it unto those who do not, and students may only participate in “receiving, filing, and storing the deposits” of knowledge they are granted within the educational context (72). While these “show-and-tells” often have a highly affective component—since generally the most striking or historically important objects are featured, which can feel special or exclusive—they rhetorically foreground a teaching model in which the instructor is the gatekeeper or expert, and students the initiates. This model, based on explication, is the target of Jacques Rancière’s The Ignorant Schoolmaster (1987), in which he argues that a student who “is explained to” is susceptible to submit to a “hierarchical world of intelligence,” in which an explanation can always be obtained or offered as superior to the student’s own intuition and research (8). Rancière suggests that by explicating, instead of fostering the development of communal knowledge and conversation that he terms “universal learning,” we may well reinstate hierarchies of knowledge that certainly apply to the special collections reading room and should be challenged: the trope of the omniscient librarian, or the equally inaccurate librarian who solely pages items without interest or understanding. If we consider the dynamic of the reading room—the physical space in which archival encounters occur—they are not dissimilar to the hierarchies of access that Rancière (1987) describes within learning: the uneven distribution of knowledge in the room, the presence of obstacles or facilitators that mediate the flow of materials that may yield knowledge, the differing institutional and disciplinary vocabularies on either side of the reference desk. Many of these discrepancies may have practical and professional purpose; for instance, security considerations require material to be distributed according to certain protocols, and standards for metadata and cataloging are often in place to facilitate physical access and storage of materials. In addition, many misperceptions about the figure of librarian or archivist as all-knowing or gatekeeping conceal the fact that staff often work with little resources, within hierarchies of supervision, and in light of their own interests or challenges regarding the material in their care. However, the presence of these limitations offers us critical possibility, and likewise opportunity to re-examine their usefulness as policies. For instance, Patrick Williams’ (2016) work on critical library pedagogy cites Audre Lorde’s exhortation to examine not just books, but also our interactions with them, and asks what possibilities might unfold if we approach special collections work in this embodied way (111). Continuing in this critical pedagogical vein, we might also consider Rancière’s (1987) idea of intelligence as “the power to make oneself understood through another’s verification,” which includes dialogue, participation, and experimentation (73). Together, these theories suggest that rather than a pedagogical model that views student knowledge, particularly at the graduate level, as deficient and in need of augmentation, teaching models within special collections might collaboratively cover the technical basics expressed by Yakel and Torres (2003)—such as negotiating discovery systems, reading a finding aid, or mastering a research statement in the reference interview—while also allowing students and facilitators to build and develop collective knowledge that addresses both practical and conceptual considerations for primary source work in a digital era. In doing so, we can reframe teaching and outreach as acts of equity and access, expanding the historically narrow range of who feels empowered to conduct primary source work. In what follows, I will suggest how this teaching model applies specifically to interdisciplinary graduate populations, and will discuss the technical and conceptual underpinnings of a year-long project titled the “Collaborative Research Seminar on Archives and Special Collections,” conducted with staff and support from the Graduate Center, CUNY and the New York Public Library. This project entailed numerous group meetings to discuss institutional partnerships, pedagogy, and student research, and culminated in two two-hour long seminars each semester, each hosting under twenty students, faculty, and staff that had been selected by application. While many aspects of this project used digital platforms—for promotion of the event, for applications, for communicating with participants, for locating relevant materials, and for follow-up communication with participants who elected to write blog posts about the experience—the core of this program was conversational, in-person, and interactive with materials. And after Ong’s (1982) discussion of using the highest technology available to understand those prior, this project uses digital methods—such as this article, as well as student blogs—to make its non-digital elements visible. Not as a preliminary to digital work, but as an essential interlocutor for it, the Seminar focused on cultivating the in-person conversations, relationships, and experiences that prepare participants for confident and critical engagement with primary source materials. Thus, I present this project as a case study, for the specificity the genre offers, but also invested in developing a pedagogical frame that considers two core principles—conversation and experience—that allow us to not only impart primary source literacy skills, but also reconsider the possibilities of what counts as “research” in our embodied encounters with primary sources. The Collaborative Research Seminar on Archives and Special Collections began as a project in the spring of 2017 to engage graduate students, faculty, and staff in academic and cultural institutions with primary source research methods, and to increase dialogue between the Graduate Center, CUNY, and the New York Public Library. In early 2017, I developed the idea for the Seminar with Alycia Sellie, Assistant Professor and Associate Librarian for Collections at the Graduate Center, CUNY, as well as subject specialist for the English program. Adam Rosenkranz, Gale Burrow, and Lisa Crane (2016) at Claremont University, who document their own “Primary Source Lab Series” begun in 2012, cite this type of collaboration—between subject specialist and librarians—as an effective model for graduate-level primary source teaching. However, like many projects, this one began not with a literature review but with an immediate concern: as a specialist, my daily work consisted of collaborating with a variety of researchers and materials, while my evenings were spent working as a graduate student in the Graduate Center, CUNY’s English Ph.D. program. I wanted to consider a structure to share my experiences as a library specialist with my academic colleagues and also to create a platform for my Library colleagues to share their expertise, ideas, and sentiments about their work. This commitment to representing voices across institutions was comprehensive, and involved a Seminar committee that included the Graduate Center Library’s Alycia Sellie, Roxanne Shirazi, and Polly Thistlethwaite, the New York Public Library’s Jessica Pigza and Thomas Lannon, faculty advisors Ammiel Alcalay (Lost & Found: The CUNY Poetics Document Initiative) and Duncan Faherty (The Early Research Initiative), the Center for the Humanities’ Kendra Sullivan and Sampson Starkweather, and Matthew K. Gold and Lisa Rhody from Graduate Center Digital Initiatives. Together, the committee negotiated pedagogical structure, the application process, and decisions that ultimately contributed to the collaborative nature of the program. The Seminar was designed for the needs of an interdisciplinary and varied applicant pool, with the perspectives of numerous committee members, facilitators, and participants whose work addresses academia, radical archives, publishing, and special collections librarianship. As Marcus C. Robyns (2001) indicates, teaching primary sources beyond discipline-specific skills and knowledge allows us to envision “the archives [as] not only a repository of the past but also a challenging center of critical inquiry” with multiple interlocutors and facets, and the Collaborative Research Seminar sought to create an experience that spoke to this concept (365). A key part of the Seminar’s pedagogy took up the primary source principles of Lost & Found: The CUNY Poetics Document Initiative, begun in 2010. This publishing initiative, under the editorship of Ammiel Alcalay and consulting editorship of Kate Tarlow Morgan, in conjunction with staff from the Center for the Humanities, connects doctoral students and guest editors with projects that explore the archives of under-published and underrepresented authors of the twentieth century, as well as lesser or unknown aspects of well-known authors. The results are published annually and draw on a variety of authors from Langston Hughes to William S. Burroughs, Kenneth Koch to Toni Cade Bambara, Diane di Prima to Ed Dorn. As editor Megan Paslawski (2013) notes, the principle of Lost & Found is to “follow the person,” an ethos that Alcalay and the editors take literally—as in, visiting poets or the unexpected institutional and personal places their works lead—and also archivally. Instead of privileging scholarly conversations and secondary knowledge that categorizes materials, Lost & Found editors are encouraged to listen closely to the documents, engaging what their primary materiality might mean (8). Given Rancière’s (1987) Jacotot, whose teaching method rests on distributing literature and then engaging with it closely, carefully, and extensively without explication, Lost & Found’s exhortation to “follow the person” models a mode of both pedagogy and academic research centered on fidelity, community, connection. As Paslawski (2013) notes, this method “allow[s] more than words to be found” in its requirement that we examine what is there, listen to it on its own terms, and forsake traditional narratives about materials for the paths they indicate (9). This method encourages a different practice of engaging with archival materials, by fostering personal relationships with heirs and literary estates, former colleagues, and other archivists, editors, and scholars to generate new insights and interest in the subject. In particular, this entails “rescuing” literary figures from the way they have been historicized (or forgotten), in order to understand the person who actually was, and restoring the live-wire network of authors and collaborators instead of siloing authors by style or literary movement. While Lost & Found focuses on twentieth-century poetry that might broadly be considered as part of the New American poetry milieu (even as it challenges the value of such a categorization), its methods are applicable to a variety of primary sources—many of which we examined in the Collaborative Research Seminar itself. While Rich’s subject is writing, this type of pedagogy is widely applicable. Rancière (1987) expresses similar sentiments—“the problem is to reveal an intelligence to itself”—but Rich’s model is distinctly expressive and supportive, beyond a baseline of fostering student self-motivation and independence (28). As with the Seminar, we might think beyond activities designed to produce proficiencies (like Rich, while acknowledging that these are essential), but look ahead to the outcome of fostering the unique type of primary source researcher our students want to and need to be. 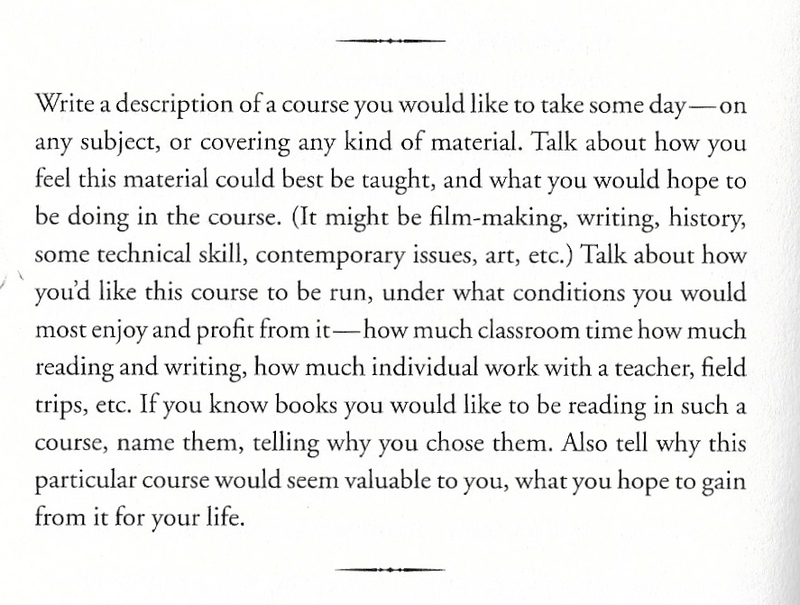 As with Rich’s pedagogy, this type of mentorship is an act of equity in its potential to expand who believes themself to be a writer, or an archival researcher—and thus, a custodian and author of our material history. As with any conversation on pedagogy, theoretical robustness depends on good implementation: this starts with understanding both learning goals and student needs. To learn more about self-reported student needs and interests, as well as manage enrollment numbers, the Seminar began its pilot year with an application process. Both the Graduate Center, CUNY, and the New York Public Library are considering how to contribute the resources necessary to continue, given that 117 students, faculty, and staff from primarily the Graduate Center, CUNY applied over the course of the pilot year in two application cycles. The volume of applicants attests to the need for this type of programming, and while the demand for the Seminar far exceeded our instructional capacity at the time, I connected with all applicants to provide additional resources and support for their work. Expressing interest across a wide swath of disciplines, skill levels, and even academic status, the application results of the Collaborative Research Seminar foregrounded the need for pedagogy with an interdisciplinary audience in mind. Given that most case studies for special collections pedagogy focus on class-specific visits that have a set subject or topic, the Collaborative Research Seminar explores a teaching model that challenges us to give voice to interdisciplinary archival experiences. The first iteration of the Seminar in Spring 2017 was hosted jointly at the Graduate Center Library and the Brooke Russell Astor Reading Room of the New York Public Library, with a cohort of 12 participants selected from 58 applicants. The second iteration involved 19 participants from 59 applicants, as an experiment to determine scalability of the pedagogical model. Most of the participants were graduate students, with one or two faculty members at each Seminar; the committee decided to prioritize graduate student applications and work towards a different model to specifically address the different needs of faculty. All participants from both sessions were given the opportunity to publish a blog, funded by the Center for the Humanities, about their experience and the items they examined at the New York Public Library, and to join the working group Primary Source, also through the Center for the Humanities. Given also the inability of the program’s structure to accommodate all applicants due to staffing and resources—a conflict at odds with the very mission of the program to increase access to special collections work—much remains to be seen as to the possibilities of this model. Each Seminar consisted of two sessions—held for two hours in the evening, two weeks apart. The first session was hosted by the Graduate Center Library and oriented participants towards specific questions and concerns in archival work. The second session was hosted in the Brooke Russell Astor Reading Room at the New York Public Library, and consisted of hands-on experiences with collection holdings. I worked with staff from the New York Public Library to curate objects from the second session in response to conversations and feedback from the first session, either around an area of research interest or a theme in archival work. Each session concluded with a short exit survey that participants completed on paper, containing basic response questions, including hopes for future sessions or information that was helpful or still being digested. To accommodate the variety of skill levels in the Seminar, participants also received a sheet on how to handle special collections material, as well as a hand-out on other Graduate Center and New York Public Library collections and resources available to them as their research progresses. In the Spring Seminar, with a cohort of 12 students, Alycia Sellie and I led the initial session of the first Seminar with an open-ended discussion on archival work. Topics discussed included challenges with finding relevant resources, negotiating expectations in reading rooms, and collaborating with archival staff. The session concluded with small group work browsing NYPL’s Archives Portal and digital catalog to find items of interest for the second session. Participants wrote suggestions for second session on notecards and submitted them before leaving. After a debriefing meeting that included feedback from the Seminar committee, I worked with Thomas Lannon and Jessica Pigza to lead the second session. Using New York Public Library collection materials from multiple curatorial units, we conceived of research tables as “stations” that addressed specific fields of knowledge or types of archival materials—including institutional records, books and annotation, serial publications, family papers, lightly processed archival boxes, and others. Items were arranged by their designated theme on a table, where participants were invited to rotate either solo or with colleagues to examine the materials. After rotating through stations, participants reconvened for a large group discussion about materials they encountered. The session ended with completion of feedback forms, and an invitation for participants to stay involved by writing a blog post or joining the working group for Primary Source at the Center for the Humanities. The Fall Seminar operated on a similar principle, although with a slightly larger cohort of 19 participants. In advance of the first session, the Collaborative Research Seminar committee distributed a list of readings to participants to assist in framing their Seminar experience, including introductions to the field of archives as well as accounts of specific experiences with primary source work (Appendix A). To accommodate a larger cohort of students, the first session drew on the rotating station model of the second session of the first Seminar. Staffed by Meredith Mann (NYPL), Tal Nadan (NYPL), Alycia Sellie (GC CUNY), Roxanne Shirazi (GC CUNY), Thomas Lannon (NYPL), and myself, the rotating stations covered four main themes. These themes, collaboratively developed and inspired by Roxanne Shirazi’s sharing of the CLIR report Terra Cognita (2016), included “Navigating Institutions,” “Negotiating Expectations,” “Documenting Processes,” and “Finding What You Need.” Participants rotated through the first three stations for short amounts of time, and then remained as a whole group in the final station—an exploration of archival vocabulary, New York Public Library discovery tools, and a working session where the group populated a shared Google Doc with items of interest as a way to experiment with collections discovery. The relatively high ratio of facilitators to participants allowed for a variety of pedagogical approaches within each station—from small activities to open discussion—as well as offered participants an opportunity to meet and connect with librarians at the Graduate Center and the New York Public Library. The second session of the Fall Seminar followed the model of the Seminar’s first iteration, featuring a series of curated stations designed around groups of documents from the New York Public Library’s curatorial units of the Stephen A. Schwarzman Building. After rotating through a few stations, either collaboratively or solo, participants convened for a larger follow-up discussion. The session ended with completion of feedback forms, and an invitation for participants to stay involved by writing a blog post or joining Primary Source at the Center for the Humanities. For both of the second sessions of the Seminar, material selection was an especially important component. We sought to not only choose generative items that spoke to multiple research possibilities, but to create a pedagogical framework in which participants could encounter these items with as little predetermination as possible. Given the interdisciplinary nature and varied skill levels of the participants, the principle of “listening closely” to documents on their own terms was key to the success of the hands-on portion of the Seminar. This was accomplished in part by mitigating expectations: in the application phase of the program, we asked participants to submit research interests, but reinforced that the Seminar was not a reference consultation and they were likely to encounter materials that did not speak to their current research topics. This openness was also facilitated by the manner in which participants were invited to encounter the materials themselves in the second session—by roaming from table to table, alone or among colleagues, for suggested ten-minute intervals. Curated stations in the reading room had minimal didactics, generally only including a small slip that indicated whether or not items could be photographed for online distribution (as on social media networks, such as Twitter). For some archival materials, we would supply the finding aid or the catalog record as an additional object on the table in its own right, to facilitate the iterative practice of negotiating the physical object alongside its metadata. Participants were encouraged to learn about the materials in this exploratory manner by speaking with the session’s facilitators and their colleagues, as well as being attentive to the nature of the encounter itself, beyond how the item might apply to their specific research. We ended the second session with a framing discussion, that allowed us as a group to consider the possibilities and limitations of such an interdisciplinary openness to materials, and what types of encounters encourage increased comfort and skill with primary source work. Specific examples of collection items from the first Seminar included Isaac Newton’s assistant’s edits on the Principia (1687), Wallace Berman’s innovative literary mail-magazine Semina, Sylvia Plath’s annotations of The Four Quartets, a copy of William Makepeace Thackeray’s Vanity Fair as a book-in-parts, Patti Smith’s notebooks juxtaposed alongside nineteenth-century commonplace books, a single box from the Timothy Leary Papers, Noah Webster’s correspondence with his daughters, among many others. These items, which range from rare books to periodicals, archival material to unique manuscript items, offered participants a variety of archival encounters to experience and discuss. Likewise, in the second session, selections included Muriel Rukeyser’s reading notes on Willard Gibbs, a collection of archival research done by Rukeyser; the mimeographed biweekly magazine, The Floating Bear, edited by Diane di Prima and LeRoi Jones; the San Quentin execution register; photographs by Jessie Tarbox Beals of the Health School at P.S. 40 in New York City in 1918, from the People’s Institute records; affidavits and inspector’s reports from Brooklyn and East Harlem from the Committee of Fifteen records; as well as documents relating to early printing in Peru, 1584-1628. Each of these stations presented a range of materials that, whether or not they directly addressed participants’ research field, afforded increased experience with the first steps of meaning-making with primary sources—to look closely, and listen to the documents. This type of close attention was modeled in multiple ways across a single collection. The New Yorker records station, curated by Tal Nadan and Meredith Mann, contained a typescript of Rachel Carson’s Silent Spring and letters to the editor in response, a print copy of The New Yorker from the Library’s general research division, and a computer opened to the New Yorker Digital Archive database. Here, we encouraged participants to think of the different digital and paper materialities of these items and how they might serve varying forms of research. For instance, sometimes a searchable database of digitized items is far more expedient than searching individual items, depending on the research question. Through printouts of the digital catalog records and discussion of digital resources, we sought to underscore how different materialities address different research needs. With material selections for special collections teaching, it is difficult to avoid the act of curation, which is traditionally associated with the “show-and-tell” format. Expertise and knowledge of collections is a valuable pedagogical resource, to frame disciplinary and methodological approaches to materials widely, as well as suggest the sheer variety of encounters that can occur in special collections. While the very act of creating stations constituted curation in the Seminar’s pedagogical model, the approach to material selection in conversation—noting its arbitrariness, its relationship to a librarian’s personal interest, and its value as an example of a type of record group—opened the idea of selection for questioning. In this way, by understanding that one must start somewhere for hands-on primary source work but that this act nevertheless predetermines the experience, the pedagogy of the Seminar used discussion to reframe and question the authority of material selection. The final aspect of each iteration of the Seminar was post-assessment, a practice that is encouraged by Anne Bahde and Heather Smedberg (2012), who advocate for “measuring the magic” as an essential component to facilitate primary source literacy and build on Esther Grassian and Joan Kaplowitz’s (2009) instructional literacy assessments of reaction, learning, and performance assessments. These translate to three rhythmic questions: “did they like it?” “did they get it?” and “can they do it?” (156). To address this, the Seminar used a questionnaire assessment, which entailed completion of a paper exit survey after each session. For the initial session, questions focused on clarifying learning objectives and understanding how participants felt about the experience, and for the second session, the questions focused on the entire Seminar structure more broadly. In terms of “did they like it”: all participants said they would recommend the program to a colleague, and when the second Seminar cohort was asked if their likelihood of using New York Public Library materials increased as a result of the Seminar, all answered affirmatively. The question of whether participants “got it” creatively appears in the resulting blog posts published through the Center for the Humanities, which I will address shortly. As for “can they do it”: the nature of graduate research is long and winding, with results diffused across publications, papers, and dissertations. Thus, while assessment is a key consideration, given the complexity of the materials and subjects we teach, metrics for assessment in graduate populations may ultimately constitute very long-term and qualitative information. In the case of the Seminar, while we have provisional information as to its reception and success, it may be too early to understand the impact on its participants and facilitators. What does offer extensive insight, however, are participant-generated blog posts that reflect on the experience. While the success of these Seminars in terms of quality of conversation, depth of thought, and general demand and interest is due to a special alchemy of enthusiastic instructors, participants, and diverse expertise, I observed two fundamental pedagogical features within the structure of the Collaborative Research Seminar. These two features—conversation, and what I will term the “archival encounter”—challenge the general protocols of the reading room in ways that are productive for both participants and instructors. In doing so, they offer an opportunity to rethink what is in fact occurring when we teach with special collections or work with primary source materials. “The archive” is often an archetype of rules, silence, and prowess—quiet rooms with careful pencils, researchers with well-formulated questions, librarians as gatekeepers to the treasures. Even with proper training on and permission to handle rare items, students may, as Patrick Williams (2018) notes, appear “almost scared to move” (118). We might consider this timidity as a result of the aura of the materials themselves, as Williams discusses, and also the imposing aura of the institution—including reading room, policies, and atmosphere. These archetypes (and indeed, stereotypes) obscure many of the realities of reading rooms, from the intellectual labor of staff to institutional hierarchies and pressures, and deserve to be thoroughly questioned (if not outright debunked). Thus, to encourage conversation around methods, to invite participants to encounter materials without research questions, context, or any hope of being an instant expert, is to de-center the authority of the reading room and reference model of special collections. This act not only demystifies, but also reimagines what parts of the archival encounter might be considered research: emotion alongside analysis, touch alongside historical knowing. In their assessment of an undergraduate-based special collections program, Melissa Hubbard and Megan Lotts (2013) reiterate the importance of responsiveness and experience in their program’s success, encouraging students to relate materials to their “own thoughts and feelings” as a way to “view themselves not only as consumers of information, but also as interpreters and creators” (32). Hubbard and Lotts describe a relatively familiar process to those who have worked in special collections: the realization that authority and answers are not to be uncovered and “consum[ed],” but rather forged. Like the methods of Rancière’s Jacotot, the experience of encountering primary sources—especially during a class visit, in the context of a seminar, or in early stages of research—defies simple explication or understanding and instead asks for more of the researcher: thinking, feeling, creating context. 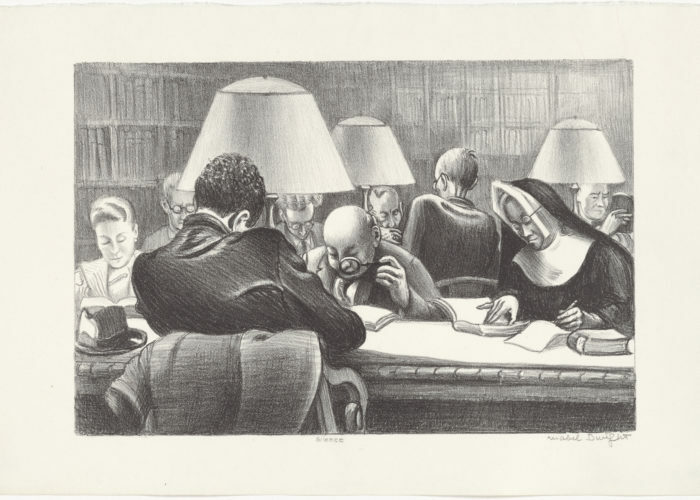 As Patrick Williams (2016) notes, the general focus on explication, or the “supplying [of] answers” in response to materials, is often transformed when the reading room becomes a classroom space, “relieved by the overwhelming impulse to notice the odd or unexpected attributes of the materials with which we share space” (118). Williams’ word, “relieved,” is critical to the affective experience of this type of encounter—when we examine items that are not part of our fieldwork, that float without context for that initial moment of encounter, the experience of archival work is suddenly not about context or answers, but about immediacy. The moment of the encounter becomes a close orbit between the object and the ability to make sense of its form, our feeling. Here, Cushing demonstrates not only the act of physically investigating the material for signs of its context—the fold in the paper, the stamp, the address—but also a key recipient, the poet John Wieners, wiggling the staple that holds the mimeographed pages closed. This act of imagination requires context—such as knowledge of Wieners’ status as a poet in the New American milieu, as well as the importance of The Floating Bear for creating poetic community when poets were far-flung, often broke, and hungry for each others’ work. However, as Cushing narrates, the act of sitting in a special collections reading room, imagining the addressee at a kitchen table, attests to the particular magic of primary source work—like crystals, these objects may hold energy of eras prior, memories, and experiences that we might tap into through imagination and experience. This collapse of boundaries is critical in the archival encounter, and the implementation of stations in the Collaborative Research Seminar intends to create space for these moments. During the Collaborative Research Seminar we tried to think beyond the limitations of the practical and to imagine what might be possible within archives. I got fired up by instances of time leaving marks in an archive, on an object; an object’s temporal layers. What drew me to the annotated SCUM Manifesto is the way it contains two characters who are the same person. It’s a record of a conversation between the author and herself, but it’s a performative conversation, enacted for an audience (but what audience?) that was already historicizing her through public characterizations of her sexuality and mental health. It resists the freezing action of historicization, existing within time dynamically. Together, conversation and “the encounter” in the Collaborative Research Seminar might echo Rancière’s (1987) idea of the material book as a site for “verification” based on its material qualities: “the materiality of each word, the curve of each sign” (15). When enmeshed as a pedagogical strategy, conversation and experience focus the instructors or facilitators not on verification of the student’s “knowledge, but the attention he gives to what he is doing and saying” (32). The second session is particularly instrumental for this process, since materials are presented as stations that participants can engage at will. Instructors may choose to circulate and linger around their favorite stations, sharing conversation with participants, or might abstain from revealing contextual details. The focus is not on transmitting knowledge, but on framing our experiences in terms of the material conditions that inspire them. At its core, the move to create practical resources and theoretical constructs around the particulars of special collections pedagogy rests on a political and ethical imperative. The movement to reconsider radical, inclusive pedagogy and decenter the economic and cultural hierarchies that restrict access to education reminds us of important precedent for destabilizing the idea of who certain institutions are meant to serve. Libraries, from the nineteenth century onward, have served as symbols of democracy (even though they may be more accurately seen as testaments to benevolent capitalism)—the New York Public Library’s latest slogan is “Libraries are for Everyone,” and now, “Knowledge is Power.” At the same time, a public institution like the New York Public Library also contains reading rooms for rare books and archives, whose use is governed under significantly different conditions than the rest of the Library. While these practices are ultimately important for the safe preservation of materials, they nevertheless create mystique, and in some cases intimidation, for those who are not used to the rhythms of special collections—students who have not been told or taught that the materials of primary sources are theirs to examine, analyze, and place within history. For instance, Cecilia Caballero’s (2017) “Mothering While Brown in White Spaces, Or, When I Took My Son to Octavia Butler’s Exhibit,” raised extensive conversation around institutional knowledge as a fundamental gatekeeping concern in primary source literacy, and in particular the political stakes of such uneven distribution of this knowledge. Caballero notes that while she applied to a fellowship to gain access to the Octavia Butler material at the Huntington Library, she took her unsuccessful application as an indication that she was not able to access the archive as a researcher and had to instead attend an exhibition of Butler’s work to examine it in person. While the Huntington Library, as well as many other major collections, permit researchers with a reference application alone, the fact that this only transparent to those already “in-the-know” poses a challenge to truly diversifying the researchers and research that occurs in special collections. Thus, to reconsider the role of special collections pedagogy as a fundamental act of access, and an act of making reading rooms more diverse and equitable, we must think critically about ways we might teach primary source research skills, including how to make meaning around objects, the institutions that hold them, and the community of people they engage. As special collections continue to invest in digitization—whether that means making catalog records or finding aids available online, digitizing images of collection materials with accompanying metadata, or sharing born-digital materials in reading rooms and through online reference correspondence—we must consider how these materials are currently being used and also how they might possibly be used in the future. In determining the future of digitally-inflected archives and special collections, there is no substitute for conversations with the research populations we hope to serve and expand. To that end, the Seminar demonstrates through its teaching model, through student blogs, and through this very article, that the fundamental piece of context for primary materials is not necessarily secondary sources, nor is it an understanding of the differences between digital and analog archival objects. Rather, by understanding our embodied selves, we might collectively acknowledge the depth of knowledge that primary source practices afford. It is my hope that the Collaborative Research Seminar might serve as an extensible and adaptable format for creating community and conversation between libraries and graduate institutions, as well as a model for an interactive approach to special collections pedagogy. While this collaborative model is an investment, for both institutions as participants, and requires extensive administrative support, as well as time spent teaching, coordinating student blogs, and following up with individual reference support, it nevertheless affords a starting point for thinking through specific practices of special collections pedagogy with graduate populations. In particular, it suggests that special collections pedagogy for graduate students is well-served by taking full advantage of methods that foreground conversation and experience, so that we might use interdisciplinary and multi-level classrooms as an occasion to listen closely to our primary sources and the ways they challenge institutional and disciplinary categories. In doing so, we will expand the possibilities of primary source work for our next generation of researchers, and welcome their fresh insights to conversations in higher education and cultural institutions alike. While this may be in part a result of changing disciplinary training, or lack of institutional resources on both sides, it may also be in part because of the high expectations of professionalization in graduate programs today—that graduate students should already have these abilities, even though the literature on undergraduate primary source literacy strongly indicates that these skills are not taught at that level evenly or consistently. While special collections, archives, libraries, and even museums all constitute different repositories for artifacts and records that we might consider primary sources, I refer specifically to library contexts in this article, and use the term “special collections” as the most capacious and broadly-applicable term, since they often contain a mixture of rare books, literary manuscripts, and archives as part of research collections curated and designated for primary source work. During this article, at times I may foreground the first person “I” to indicate aspects of my professional and personal experience that shaped this program as well as my critical response to it, including my status as a doctoral candidate at the Graduate Center, City University of New York (CUNY), during planning; as a literary manuscripts specialist at the New York Public Library’s Henry W. and Albert A. Berg Collection of English and American Literature; and as an editor of Lost & Found: The CUNY Poetics Document Initiative, a publishing collective for primary source materials. It is my hope that this specificity will make clear the veritable alchemy that constitutes primary source pedagogy, as well as encourage others to reflect on their unique capacity to create similar projects with their own strengths and intentions. While the special collections of the New York Public Library have a longstanding relationship with CUNY students, and for decades have partnered with professors and staff to facilitate class visits, no formal structure exists to consistently and annually link the Graduate Center, CUNY, and the New York Public Library on the specific topic of primary source literacy and practices. Given the size and scope of both of these institutions, as well as the variety of student and instructor needs from special collections class visits, this is of course understandable. At the same time, the Seminar’s collaborative design, with two sessions that span the Graduate Center Library and the manuscript and print-based special collections of the Stephen A. Schwarzman Building, fills a gap in graduate and professional-level instruction on primary source research methods across these institutions, and considers how a sustainable model of engagement might look in future iterations. Additional teaching was provided by Tal Nadan, Meredith Mann, and Emilie Yardley-Hodges from the New York Public Library. This additional support took the form of a digital resource with a list of New York Public Library and Graduate Center resources, individual reference consultations via email or in person, and an invitation to join an open-ended working group titled “Primary Source,” with the Center for the Humanities. This Seminar is not a sole effort within the New York Public Library or the Graduate Center Library to consider special collections pedagogy; numerous staff are engaged with this question, across divisions and disciplines, at any given time. Rather, I intend to examine the practical and theoretical considerations of this particular event while making visible as much as possible the labor contributed by staff members from both institutions. Badhe, Anne and Heather Smedberg. 2012. “Measuring the Magic: Assessment in the Special Collections and Archives Classroom.” RBM: A Journal of Rare Books, Manuscripts, and Cultural Heritage 13 (2): 152–174. Bahde, Anne, Heather Smedberg, and Mattie Taormina. 2014. Using Primary Sources: Hands-On Instructional Exercises. Santa Barbara, California: Libraries Unlimited. Derrida, Jacques, and Eric Prenowitz. 1996. Archive fever: a Freudian impression. Chicago: University of Chicago Press. Freire, Paulo. 1970. Pedagogy of the Oppressed. Translated by Myra Bergman Ramos. New York, London: Continuum Press. Published 2005. Grassian, Esther S. and Joan R. Kaplowitz. 2009. Information Literacy Instruction: Theory and Practice. New York, NY: Neal-Schuman Publishers. Hubbard, Melissa and Megan Lotts. 2013. “Special Collections, Primary Resources, and Information Literacy Pedagogy.” Communications in Information Literacy 7 (1): 24–38. Mitchell, Eleanor, Peggy Seiden, and Suzy Taraba. 2012. Past or Portal? : Enhancing Undergraduate Learning through Special Collections and Archives. Chicago: Association of College and Research Libraries, a division of the American Library Association. Ong, Walter J. 1982. Orality and Literacy: Technologizing the Word. London and New York: Routledge, Taylor and Francis Group. Reprinted 2002. Paslawski, Megan. 2013. “Publishing’s Restorative Properties.” American Book Review 34 (3): 8–9. Rancière, Jacques. 1987. The Ignorant Schoolmaster: Five Lessons for Intellectual Emancipation. Translated by Kristin Ross. Stanford: Stanford University Press. Published 2001. Rich, Adrienne, Iemanjá Brown, Stefania Heim, Erica Kaufman, Kristin Moriah, Conor Tomás Reed, et al. 2013. “What we are part of”: Teaching at CUNY: 1968-1974, Adrienne Rich. New York: Center for the Humanities, the Graduate Center, City University of New York. Lost & Found: The CUNY Poetics Document Initiative. Robyns, Marcus C. 2001. “The Archivist as Educator: Integrating Critical Thinking Skills into Historical Research Methods Instruction.” In The American Archivist, 363–384. Rosenkranz, Adam, Gale Burrow, and Lisa Crane. 2016. “Developing a Primary Source Lab Series: A Collaboration Between Special Collections and Subject Collections Librarians.” In Collaborating for Impact: Special Collections and Liaison Librarian Partnerships, edited by Kristen Totleben and Lori Birrell. 163–86. Chicago: ACRL/ALA. Williams, Patrick. 2016. “What Is Possible Setting the Stage for Co-Exploration in Archives and Special Collections.” In Critical Library Pedagogy Handbook Volume 1, edited by Kelly McElroy and Nicole Pagowsky, 111–120. American Library Association. APPENDIX A: Advance reading list for Fall 2017 first session of Collaborative Research Seminar. Mary Catherine Kinniburgh works at the New York Public Library, where she specializes in literary manuscripts and exhibitions. She earned her doctorate from the Graduate Center, CUNY, where her dissertation focused on libraries belonging to poets like Charles Olson and Diane di Prima in postwar America. She has served as a Digital Fellow at CUNY and Columbia Libraries, a Teaching Fellow at Brooklyn College, and is currently an editor for Lost & Found: The CUNY Poetics Document Initiative. “I came to explore the wreck,” Adrienne Rich begins in her poem “Diving into the Wreck,” and tumbles to the depths of her questions about efficacy—of speaking, of writing, and of teaching—during a time when students activists shut down campuses across the country, striking for anti-racist education policies from curriculum design to admissions. With a desire to connect our students at Brooklyn and Queens College with the history of student activism at CUNY, we developed a semester long peer-peer writing exchange to take place between our composition classes where our students developed and exchanged writing prompts inspired by Rich’s archival teaching material. By having our students document and record the unfolding of their written exchange, we argue that this type of collaborative project offers a new way of conceiving how participants in a classroom can build, envision, and record new ways of learning. As every classroom leaves behind an archive of writing, notes, and lesson plans, we ask, what do we do with the written materials we and our students leave behind, the materials that signal the embodied work of building a space of learning? How can the work that students leave behind inspire and enact its own unique pedagogy? This paper will present the unfolding of our students’ writing exchange, ultimately demonstrating that the archive of materials left behind by Rich and our own project can further inspire students and instructors to question what is possible while living and working in the ever-shifting space of the writing classroom. Figure 1. The image above shows a writing prompt created by a first year writing student at CUNY for the intra-classroom writing exchange between Brooklyn and Queens College. “I came to explore the wreck,” Adrienne Rich begins her poem, and tumbles to the depths of her questions about efficacy—of speaking, writing, and teaching—during a time when student activists shut down campuses across the country, striking for antiracist education policies from curriculum design to admissions. When, as instructors of writing at Queens College and Brooklyn College, CUNY, we realized that we’d independently assigned our first-year writing classrooms selections from Rich’s recently published archive of teaching materials, we knew that beyond reading and analyzing her writing exercises, syllabi, or notes, our students would need to produce an archive of teaching materials of their own. We wondered, what could the process of recording and collecting their own work teach our students about the archive itself? Designed as a collaboration between our students, ourselves, and Adrienne Rich’s teaching materials from Basic Writing at City College, we created an intra-classroom writing exchange in Spring 2018 which drew on the recent publication, ‘What We Are Part Of’: Teaching at CUNY: 1968-1974, (Parts I & II), published by Lost & Found: the CUNY Poetics Document Initiative in 2013. The project involved a total of forty-nine students, twenty-five at Queens and twenty-four at Brooklyn; half of the twenty-four Brooklyn College students were in CUNY’s SEEK (Search For Education, Elevation, and Knowledge) Program. Working simultaneously with other primary documents circulating during Adrienne Rich’s time at CUNY, our classes used digital file-sharing technology to eventually create an archive of their own writings. While discussing that no archive is ever complete–that any written record is a reconstruction of a lived context–we approached the archive as an evolving and contingent pedagogical map. Adrienne Rich’s poem “Diving Into the Wreck” was an important locus for this conversation because of the ways we were able to evoke the poem in the classroom as a living archive in a critically contingent digital space such as PennSound. Both classes listened to audio recordings hosted on UPenn’s poetry archive, giving students the chance to hear a recording of Adrienne Rich reading “Diving into the Wreck” at Stanford in the 1970s. The resonance of the poem’s themes in our own classrooms emphasized how the archive is kept alive and determined by the spaces in which it is contained. Ultimately, this allowed students to envision themselves as doing the work of both institutional critique and self archiving. Lost & Found: the CUNY Poetics Document Initiative, published by the Center for the Humanities at The Graduate Center, CUNY, publishes “extra-poetic” material such as correspondence, journals, notes, transcriptions of letters and syllabi and pedagogical residue related to New American Poetry. Lost & Found “finds” the archive in sites which concretely include personal and institutional collections, raw materials gathered by editors, in interviews with living writers and selections from their material records, documents which circulate among poets, scholars, educators and fans, and in recirculated volumes which find their homes in collections, in libraries and in the classroom. More abstractly, the project locates the archive in person-to-person contact, verbal and non-quantifiable exchange, affective registers and especially in friendship. The extent to which the classroom and the archive are considered together in the Lost & Found project cannot be understated. The publication collects pedagogical materials from a generation of poet educators teaching at CUNY in the 1960s and ‘70s. The Center for Humanities curates suggested groupings on their website for contemporary educators engaged in the building of syllabi for courses across CUNY and beyond with themed collections such as “Feminist Practice and Writing”; “Teaching Pedagogies/Methodologies”; “Resistance”; “Friendship and Politics”; “Radical Poetics”; “Queer Poetics,” and more. Series IV’s “What We Are Part Of”: Teaching at CUNY: 1968-1974, Adrienne Rich (Parts I & II), collects the material traces of poet Adrienne Rich’s teachings at City College, and the series’ pedagogical focus continues with Series VII’s publication of investigations into other CUNY poets and educators: June Jordan: ‘Life Studies,’ 1966-1976, Audre Lorde: I teach myself in outline, Notes, Journals, Syllabi, & an Excerpt from Deotha, and Toni Cade Bambara: “Realizing the Dream of a Black University” & Other Writings (Parts I & II). In the volume we introduced to our CUNY classrooms, we discussed how the notes, syllabi, and writing assignments created by Adrienne Rich exist not only as a record of poetic inquiry and pedagogical theory that Rich engaged with while teaching at City College, but also as a testament to the relationships formed through Rich’s commitment to deploying the “classroom” as a performative space in which writing, protest, and embodied action intersected. In designing an assignment sequence of our own, we noted the contingency inherent to the notion of the “classroom” for Rich: with classes closed frequently during the period due to student strikes and institutional flux, letters exchanged in the mail and individual meetings off-campus became the learning environments for Rich’s composition students. The ontological designation that comes with naming helps us understand that Rich often called the classroom into being through an act of naming alone: to declare an exchange a “classroom” makes it so, whether in a basement cafeteria or by way of the U.S. Postal Service. In fact, where Rich locates the classroom is as important as how and where she dislocates it, for to her the classroom is also “cell–unit–enclosed & enclosing space in which teacher & students are alone together / Can be a prison cell / commune / trap / junction–place of coming-together / torture chamber”(Rich 2013, vol. 1, 15). In our own writing exchange, the use of file-sharing technology facilitated the exchange of student writing outside and between our two classrooms. Each classroom was able to create a folder of student work in Dropbox that functioned as an online dossier. So while our classrooms were separated across two different physical campuses, our students’ works were collected in this temporary digital classroom. Figure 2. Image from Adrienne Rich, “What We are Part Of”: Teaching at CUNY: 1968-1974 ed. Iemanjá Brown, Stefania Heim, erica kaufman, Kristin Moriah, Conor Tomás Reed, Talia Shalev and Wendy Tronrud, (Lost & Found: The CUNY Poetics Document Initiative Series IV, 2013), 15.
make all education truly open to all people who want it b. movement for educational reform–such programs are surely going to effect changes in nature of teaching at all levels […]. (Rich 2013, vol. 1, 15). To locate the classroom in the exchange between teacher and student and simultaneously in the nationwide cultural revolution is to bring politics to the classroom and the classroom to the world. Rich knew that to teach in the classroom was to engage the world from close proximity, a paradox because such engagement allowed her to tap into much more far-reaching social and political engagements than she’d found through poetry alone. Figure 3. Image from Adrienne Rich, “What We are Part Of”: Teaching at CUNY: 1968-1974 ed. Iemanjá Brown, Stefania Heim, erica kaufman, Kristin Moriah, Conor Tomás Reed, Talia Shalev, and Wendy Tronrud, (Lost & Found: The CUNY Poetics Document Initiative Series IV, 2013), 7–8. 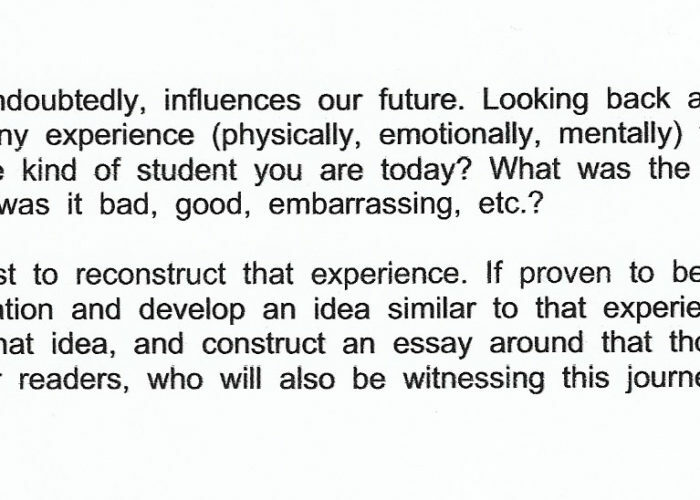 This first part of the assignment sequence asks students to put themselves in Rich’s classroom and imagine how the stakes of writing changed when the campus was transformed by protests. 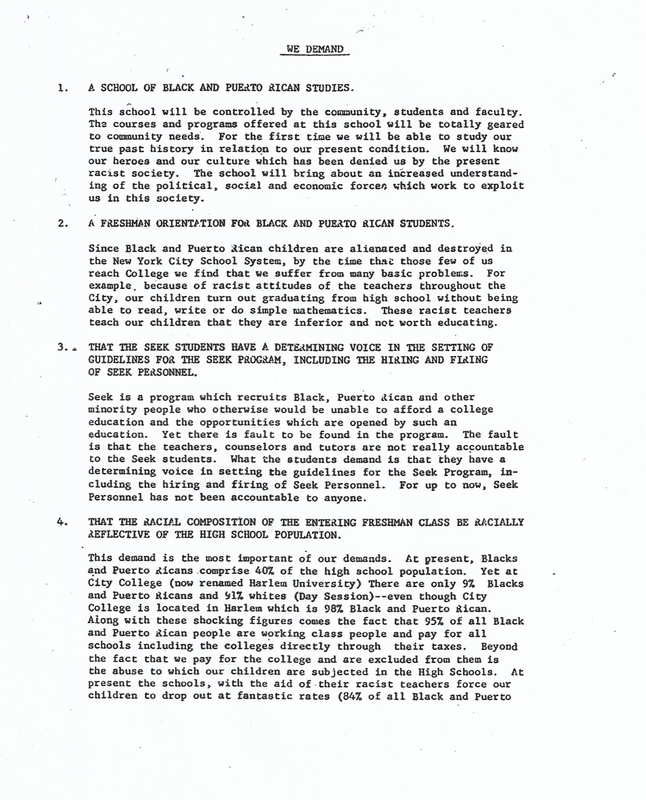 Our students were asked to read the “5 Demands” distributed in 1969 by a group of Black and Puerto Rican students at City College asking for equal representation and anti-racist admissions processes, as well as flyers, pamphlets, and notes that circulated across CUNY. Some of these materials can be found in the CUNY Digital History Archive, an online archive that collects digitized materials from CUNY’s history beginning in 1847 with the creation of the Free Academy in New York City and continuing to the present moment. To help students conceptualize their relationship to wider CUNY history, the CDHA offers a rich entry into the history of CUNY’s infrastructure, policies, and impact as a public institution, a history that implicates each student and determines their experience of education in the present. 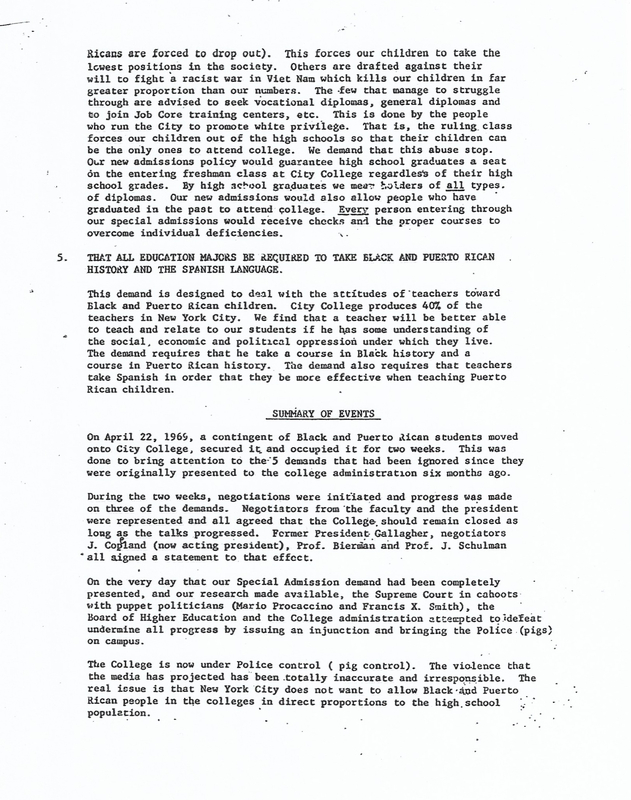 For instance, in order to access the “5 Demands,” students had to locate a link titled the “Creation of CUNY–Open Admissions Struggle” from a longer timeline, which ushered them to a page presenting wider archival materials from the late 1960s (oral histories, articles from student newspapers, and faculty memos). The CDHA’s Project History, which we also explored in the classroom setting, emphasizes that the CHDA emerged out of “gaps in the knowledge of CUNY faculty, students, staff, and alumni about that history,” a mission that resonated with our class’ focus on the archive as a means of generating engagement in the present with activism in the past. Figure 4. Unknown, “Five Demands,” CUNY Digital History Archive, accessed September 26, 2018, http://cdha.cuny.edu/items/show/6952. The next component of the assignment sequence had students compose their own writing prompts to be exchanged through the same Dropbox folder with a student at a different campus. Giving students the option to use the Dream Course they designed as inspiration for their exercise, we randomly assigned partners to students at Queens and Brooklyn Colleges. Two weeks later, after our students received their completed assignments, each class discussed their initial reactions to their partners’ responses and to the assignment sequence more broadly. Finally, our students reflected on their experience on their own and turned in a portfolio of the whole exchange, including a final reflection essay. Figure 5. The above image shows a student prompt created for the writing exchange. Figure 6. The above image shows a student prompt created for the writing exchange. Adrienne Rich’s Writing Exercises are opportunities for “reflection and action,” each assignment prompting students to tease out a “relationship to his [her/their] world, to his identity, to his sense of time and space, his trust in and suspicion of others, his ways of identifying others” (Rich 2013, vol. 1, 30) By designing their own writing prompts and then documenting the unfolding of an epistolary exchange, students came to a new way of conceiving of how participants in a classroom can build, envision, and also leave a record of the work that can move beyond the space and time of a single classroom. Remarking on the experience of working with partners they have never met in person, a student at Brooklyn College observed that the structure of the assignment performs the process of community building and activism: “[The exchange] could be seen as a performance from Adrienne Rich’s notes on teaching…it could resemble the strike from the 70s and us having to always engage even with students we have not interacted with.” During the university-wide strike, solidarity meant connecting students from different CUNY institutions through a circulation of flyers, memos, and other written material; community was created through shared embodied demonstrations and exchanges across CUNY’s disparate campuses. As this student points out, this project forged connections between students from Queens and Brooklyn, which helped students feel embedded in CUNY, a public university comprised of twenty-five campuses across New York City’s five boroughs. Now as the complexity of our students’ exchange is embodied in—and reduced to—a folder of written documents, our students experienced how the archive is always incomplete in so far as it is only a fragment of a dynamic and living context; furthermore, the archive is always changing as it is part of an ongoing dialogue between the moment of its creation and the work it inspires today. When we envision future iterations of this assignment, we realize we as instructors need to account for how the habits and codes we used to relate to students influenced the structure of the exchange. As one student suggests, allowing students to contact each other on their own terms—rather than through the instructors—would emphasize the importance of writing for one another rather than depending on the instructors’ authority. Beyond putting students in direct contact with one another in both public and private platforms for exchange, we conceptualize a means of engaging a wider public by collaborating more directly with existing digital platforms such as Lost & Found, CDHA, and PennSound. Since these public archives served as key pedagogical material and framing devices for students, we envision the next steps of this project as not just engaging with but contributing to their form and content. Projects that allow students to engage with the historical record through a practice of self-archiving challenge us to restructure existing hierarchies and rethink where and how learning takes place. By envisioning a type of study rooted in investigating and enacting the process of building an archive, this project produces an immaterial space within the university where students shift the power and become the interlocutors for each other. It is in this not-yet-mediated space of connectivity and exchange that we were able to honor and continue the work of CUNY’s student-activists; it is here that we can build new archives of learning in and beyond the classroom, to “reexamine all that we’ve been doing, try untested things, put ourselves on the line, be willing to take risks” (Rich 2013, vol. 1, 16). Rich, Adrienne. 1973. Diving into the Wreck: Poems, 1971–1972. 1st ed. New York: Norton. Rich, Adrienne. 2013. “What We Are Part Of.” In Teaching at CUNY: 1968-1974, vol. 1–2, ed. Iemanja Brown et al. New York: Lost and Found. Lost & Found. n.d. “About Lost & Found.” Accessed June 15, 2018. https://www.centerforthehumanities.org/lost-and-found/about-lost-and-found. Marguerite Daisy Atterbury is a writer and doctoral student at The Graduate Center, CUNY. Her research centers on 20/21st C. poetry with an interest in gender, race and coloniality. She is the co-director of NM Poetics, an annual summer program founded in 2010 to support conversation around aesthetics and politics in northern New Mexico. Her work engages audiences through various media including film, installation and performance as well as more traditional outlets of production and publication. She received her MFA from the Milton Avery School of the Arts at Bard College. Maxine Krenzel is a doctoral student in English at CUNY’s Graduate Center. Her research interests are in composition-rhetoric theory, focusing on the history and pedagogy of first year writing programs, as well as feminist theory and autobiography. She teaches writing, literature, and ESL courses at Brooklyn College. This paper considers the potential of archivist–faculty collaboration to open and build engagement with women’s history–related collections. Collaborative digital scholarship projects built around institutional primary-source collections advance course- and discipline-specific goals and impart critical lessons about research and knowledge production to students. We share and reflect upon a dynamic Wikipedia project carried out in a feminist theory course, highlighting an accessible approach to archival research and digital methods. The project produced work that emphasized academic challenges and debates around sources of knowledge. Over two iterations of the project, students interacted with the library’s archival materials, analyzing and synthesizing this information into Wikipedia articles, and engaging in discussions of archival practice and feminist knowledge production. We propose that Wikipedia offers a unique set of openings into women’s history for undergraduate students, providing an accessible platform with a low barrier of entry for students coming to a digital project for the first time. Wikipedia provides a compelling base for students to engage with global audiences while struggling with editorial criteria that value objectivity and notoriety. Through the collaboration between students, archivists, faculty, and Wiki Education Foundation staff, this project demonstrates the importance of a team approach to supporting students as they work through a challenging research project for a public audience. Wikipedia is an open access, online resource built on the creative and administrative contributions of thousands of individuals around the world. With more than 35 million articles in 280 languages, Wikipedia is a ubiquitous presence in popular culture and the classroom alike. An immediately familiar resource for students (and often the place where they begin their research), Wikipedia is increasingly recognized as an essential component of the research process, “an essential tool for getting our digital collections out to our users at the point of their information need” (Lally and Dunford 2007; cf. Head and Eisenberg 2010). The openness of the platform to anyone interested in contributing, however, has exposed some biases and deficiencies in the encyclopedia’s coverage and editing community. Wikipedia has a major gender imbalance in contributing editors—women are estimated to make up 9 to 13 percent of them (Wadewitz 2013; Bayer 2015)—and the editing community has largely minimized women’s history, with an estimated 15.5 to 17 percent of the biographical articles focusing on women (Proffitt 2018; Moravec 2018). Feminist activists and scholars have developed a set of approaches to address the Wikipedia gender gap. In 2012, undergraduate student Emily Temple-Wood founded the WikiProject Women Scientists, which sought to ensure “the quality and coverage of biographies of women scientists.” Alongside Rosie Stephenson-Goodknight, she co-founded WikiProject Women in Red. On Wikipedia, red links mean that “the linked-to page does not exist‍.” The Women in Red project continues to create lists of links that are either about “a woman, or a work created by a woman.” These efforts garnered Temple-Wood and Stephenson-Goodknight the first co-awarded Wikipedian of the Year award. Aaron Halfaker (2017) notes how Temple-Wood’s efforts not only improved the quantity of content related to women on Wikipedia, but also the quality of entries. Collective gatherings have shown promise for supporting new editors, as groups like Art+Feminism, AfroCROWD, Fembot, and FemTechNet have taken a “do-it-yourself and do-it-with-others” approach. Wiki edit-a-thons hosted by such groups take place in public spaces like coffee shops and museums, and at libraries ranging from New York Public Library’s Schomburg Center for Research in Black Culture to Connecticut College’s Shain Library, the site of this study (Boboltz 2017). Librarians have taken on a key role in facilitating the work of groups seeking to add content about marginalized people and issues to Wikipedia. They have sought out ways to not only support activists doing this work, but also to institutionalize engagement with Wikipedia. For example, at West Virginia University, academic librarians worked to enable students to receive required service credit hours for editing Wikipedia, drawing sorority groups and graduate students into this work (Doyle 2018, 63). Finally, as evidenced by the work of Wiki Education, classes are increasingly bringing together student learning with editing Wikipedia: in the Fall 2018 session, 321 classes participated across a wide range of academic fields. Over three iterations, a feminist theory class and the Linda Lear Center for Special Collections & Archives at Connecticut College collaborated on an in-depth Wikipedia archival research assignment (Appendix 1) with a twofold goal: first, to address some of these Wikipedia deficiencies by creating and editing articles through a feminist scholarship lens, and second, to engage students in the process of knowledge creation for a public audience (Appendix 2). This project built upon an ongoing collaboration between faculty and archivists to develop project-based learning opportunities in institutional collections, and reflects a growing recognition of Wikipedia’s potential for generating “meaningful service learning experience[s]” for students (Davis 2018, 87). The first iteration of the course allowed students to develop topics that were far ranging, but this initial approach resulted in some issues with their engagement with Wikipedia (e.g. overly specific topics or concepts that were difficult to document). The second and third iterations of this course focused on identifying gaps in Wikipedia that could be directly tied to the Lear Center’s collections. The team reviewed course learning goals and developed a list of relevant material in the Lear Center (Appendix 3) which connected to themes in feminist theory such as women’s leadership, ecofeminism, poverty, and racial and disability justice. Students conducted research using these collections and worked to either generate or modify existing Wikipedia content. Students then summarized their experience in public presentations at the end of the semester. The resulting project represents a collaborative approach between students, faculty, and archivists, and showcases the community of shared interests and values that are fundamental to the digital humanities (Scheinfeldt 2010). This paper argues for the power and potential of this type of collaboration in developing projects that challenge students to engage in practical feminist praxis and to make connections between theory, archives, and public digital engagement. Digital engagement with Wikipedia offers a unique set of openings into feminist theory and history for undergraduate students. Wikipedia serves as an accessible platform for students to consider questions of evidence, representation, and knowledge creation. While many use Wikipedia as the first stop for information, few understand how this information is created. The project team recognized that the platform’s ubiquity and familiarity could serve a dual purpose: first, to emphasize the importance of contributing reliable, accurate information to a site used by so many, and second, to help mitigate potential nervousness about working with digital technology in the public realm. This pedagogical approach ensures that students understand the historical and political context of Wikipedia and its community. They can draw upon their experience with this platform to ask questions and actively engage with media. The team partnered with the Wiki Education Foundation (Wiki Ed), a non-profit entity separate from Wikipedia that supports faculty who incorporate Wikipedia into their curriculum. The program emphasizes that students “gain key 21st century skills like media literacy, writing and research development, and critical thinking, while content gaps on Wikipedia get filled thanks to [their] efforts” (Wiki Education, n.d.). Wiki Ed provides tools and resources, including interactive tutorials about the tenets of Wikipedia and basics of editing and adding content. The Wiki Ed Dashboard serves as the digital home for the class, enabling faculty to create and manage their Wikipedia assignment and to monitor student progress. For students, it contains the tutorials and relevant information for the Wikipedia assignment and allows them to track the progress on their article as well as that of their classmates. Faculty and archives staff use the dashboard to design and monitor students’ work in real time. A key aim of the project was that students experience the process of conducting and presenting research. Much of feminist theory is based in intensive critique of research and representational practices. Students risk becoming either highly critical of all scholarship without engaging the merits of the work or fearful of creating their own work, believing that it will also be easily criticized. In this assignment, students learned to balance rigorous critique with a strong understanding of knowledge production. Editing content for a general audience on Wikipedia raised the stakes for students: the challenge of writing for the public proved more rewarding than the perceived standard of writing for only the instructor (Davis 2018, 88). The team presented Wikipedia’s overlapping gender and racial imbalance as a problem that students had the power to address as part of a broader scholar-activist community. Student feedback about the challenge and meaning of the assignment supports scholars’ arguments that structured opportunities for student interaction with institutional special collections and archives generate deeper engagement with and investment in research and its meaning (Tally and Goldenberg 2005). Connecticut College is a private, undergraduate liberal arts institution in New London, Connecticut. It offers 56 majors, minors, and certificates to approximately 1850 undergraduates. As with many liberal arts colleges, Conn’s culture is deeply rooted in teaching and learning. These efforts are supported by several campus resources and partnerships, including the Center for Teaching and Learning and the Technology Fellows Program, as well as by collaborations between faculty and staff in the six academic centers across campus, the campus’ Charles E. Shain Library, and the Linda Lear Center for Special Collections and Archives. The Lear Center is home to Connecticut College’s collections of rare books, manuscripts, and archives. The Center works extensively with faculty to develop projects which engage students in active primary source research, both in the classroom and increasingly as a part of the College’s emerging Digital Scholarship program. The Digital Scholarship program provides technological, project, and platform support for student, staff, and faculty digital projects with a focus on the pedagogical, classroom-based side of digital scholarship. The Lear Center has been involved with the College’s Digital Scholarship efforts from the start, as it sees digital scholarship as a natural extension of outreach and use activities. By combining primary source research with digital methodologies, the Lear Center offers students a unique opportunity to become active producers of knowledge, rather than passive consumers, and to convey this knowledge to a real-world audience. Gender, Sexuality, and Intersectionality Studies (GSIS) emphasizes feminist praxis, the “philosophy and practice of participatory democracy and situated knowledges” (Naples and Dobson 2001, 117). At its heart, feminist praxis is a call for hands-on engagement with core questions within the field, particularly in how each person can participate in the creation, circulation, and usage of knowledge. While feminist theory can be taught in a manner that solely focuses on theories of gender, sexuality, and other categories of analysis, the course provides an opportunity to enact a praxis-based pedagogical strategy. This approach can deepen students’ understanding of theory, asking them to apply theory to their work and consider its accuracy or limitations when put into practice. Feminist theory presents a challenge to undergraduate students who are drawn into GSIS through varying avenues. As feminist theory is interdisciplinary, students encounter authors that may be writing from fields or on topics they have yet to study. They also may not have developed necessary reading skills or frustration tolerance (that is, the ability to navigate work that is dense, references unfamiliar ideas and academic jargon, or challenges their perspective). Scholar Gloria Anzaldúa (1991, 252) argues that “[t]heory serves those that create it” and that as a queer woman of color, she had to challenge existing theories to adequately account for her knowledge and experiences. Indeed, students may struggle to see themselves or their concerns in texts that are written in a language and for an audience far removed from themselves, or in the disproportionate amount of scholarship written by white Western cisgender women. However, Anzaldúa also reminds us that works have “doors and windows,” or entradas (1991, 257). As readers come with a need to find themselves in texts, having multiple entradas through diverse course readings and assignments creates a range of opportunities to engage with and find connections to feminist theory. It is imperative for instructors to find ways to address these concerns while ensuring that students directly work with the scholarship that undergirds the field and its contributions more broadly. It was important to devise course assignments that asked students to put into practice the frameworks they were using so that they could more critically understand the stakes of feminist theory, articulate key ideas in their own words, and apply these concepts to unique projects. The platform of Wikipedia offered a novel means to take feminist theory out of the ivory tower and illuminate the value of the course content for students. Positioned as editors, students were challenged to make meaning out of theory and archival materials for a broad audience. Working with Wikipedia made coursework relevant by making it accessible to a public at large, thus enabling to students to find a compelling reason to stay engaged throughout. Coupling the Wikipedia platform with archival research provided a set of connections and resources to facilitate the achievement of these pedagogical aims (see the Fall 2017 course dashboard). Faculty and archives staff reviewed course learning goals and core themes and identified relevant, robust topics in the collection that either had underdeveloped pages or were absent from Wikipedia. Collections were assessed to ensure each had sufficient primary and secondary material to build an entry that would meet Wikipedia’s standards. Students used primary source material such as photographs, correspondence, and reports, while drawing upon secondary sources to verify their claims and authenticate their subject’s notability, a critical standard of Wikipedia. The practice element of feminist praxis requires skill building and serves to reinforce the content of feminist scholarship. As students worked with Wikipedia, they practiced what feminist theorist Donna Haraway describes as learning the ins and outs of knowledge production and representation. She argues that “understanding how these visual systems work, technically, socially, and physically, ought to be a way of embodying feminist objectivity” (Haraway 1988, 583). Through the process of conducting research in the archives and in secondary sources, drafting and revising content for Wikipedia, and then presenting and reflecting on this work, students were challenged to consider multiple facets of knowledge production. Moreover, they encountered those questions and challenges at the heart of feminist debates about epistemology, as they considered the perspectives included in the archival source material, their own positionality in relation to their research, and the dynamics that exist within Wikipedia vis-à-vis its standards and editing community. In response to standpoint and situated knowledge theories, it is de rigueur in feminist theory to recognize and acknowledge one’s relationship to a topic (Collins 1986; Haraway 1988; Harding 1992). While feminist scholars range in their approach to academic tone, there is generally an acceptance of taking stances that explicitly embrace values such as antiracism and antisexism, rather than avoiding any direct acknowledgment of their interest in a subject and the stakes of inquiry (hooks 1998; Mohanty 2003). The encyclopedia form of Wikipedia thus at once provides an opportunity to build a broader audience for feminist-themed topics while disavowing the motivation that drives feminist engagement with the platform. The presumption of prominence fails to address the ebb and flow of cultural memory, and in practice requires that women rise to a level of exceptionality to register as worthy of inclusion in Wikipedia. Moravec cites the reality that the “‘List of Pornographic Actresses’ on Wikipedia is lengthier and more actively edited than the ‘List of Female Poets.’” While arguably both lists could serve as useful sources of information, this gap highlights an editorial priority based on editors’ personal consumption practices rather than the quantity or quality of an artist’s contributions. Wikipedia itself has articles addressing the challenges of notability, and includes discussions of the two camps, deletionists and inclusionists, who struggle over either stringent adherence to the requirement or the allowance of entries that are viewed as “harmless.” The ongoing struggle over how to best balance the intention of Wikipedia to serve as a reliable source of information with the demand for increasing inclusion of diverse content, and editors who echo broader debates within feminist scholarship and our society at large, is critical for students to take on in their learning. Figure 1. A student created a new Wikipedia entry for Eli Coppola, a poet whose work addresses disability and sexuality. The project’s aims—archives staff’s desire to develop extended, class-based community engagement with library resources and collections, and the faculty member’s desire for students to participate in the collaborative process of planning, conducting, and presenting their research to a public audience—were met. The project’s design allowed students to demonstrate their learning through multiple formats (archival research, work with Wikipedia, a poster presentation, and a reflection essay), as well as to provide feedback through the reflection essay, in-class discussions, and the anonymous, end-of-semester teaching evaluation. 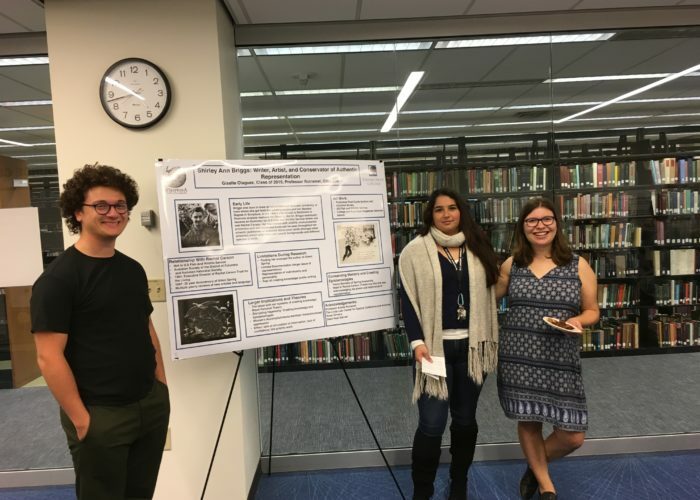 While students at times struggled with the assignment, the project team determined that they not only gained skills related to feminist theory, metaliteracy, and critical reading, but recognized the long-term value of their work for their future careers. Students presented their work publicly in the college library through poster presentations. Along with a final reflection essay, these components served to assist students in recognizing the level of effort that they put into this project and its significance to their understanding of feminist theory. Students’ projects were assessed on their work in the archives, the Wiki dashboard, effort and collaboration with classmates, and their poster presentation and reflection essay (Appendix 5, Appendix 6). This assessment approach emphasized students’ engagement and centered the need to connect their work with archival material and Wikipedia with course readings. The assignment set a clear expectation that students engage in feminist praxis, considering how the work they were doing in researching and creating public-facing content was informed by feminist theory and vice versa. Similar to how feminist epistemology seeks to change, redefine, and rewrite mainstream theories which exclude women’s narratives … metaliteracy “challenges traditional skills-based approaches to information literacy” [Mackey and Jacobson 2011, 62]. By putting questions of epistemology into conversation with metaliteracy, the student emphasized the ways that the assignment helped students think and act critically in their project work. Two students’ responses to engaging with Wikipedia demonstrate the struggles they encountered and their differing attitudes to the project’s outcomes. The first student’s response centered on the importance of working in the archives. They wrote, “Through the use of primary documents and news clippings found in the archives, I was able to navigate the problematic limitations that Wikipedia exhibits.” They found that the collections provided the necessary content to ensure that they were showing notability and to avoid challenges raised by Wiki editors. Figure 2. A Wiki editor claimed that naming Audre Lorde’s “sexual preference” was offensive. Lorde was a famously self-described “black, lesbian, mother, warrior, poet” who emphasized the importance of naming herself in her writing. This editing challenge suggests a bias against public identification of LGBTQ people. In contrast, another student was frustrated by the constraints of Wikipedia. They argued that due to Wikipedia’s neutrality standards “feminist knowledge is neither present in its full unapologetic extent, nor is it accessible to the global web users.” The student recognized the potential of Wikipedia to reach many people and was thus frustrated that the process of composing work for Wikipedia required both a tone and selection of content that did not align with either the student’s understanding of feminist knowledge or course readings that were unapologetically explicit in their political aims. While this response may be viewed as a negative outcome, it showed students’ conscious engagement with a critical question about how feminist knowledge circulates and is constrained, as well as a deeper understanding of how Wikipedia operates. collaborating with the Wiki Education Foundation and the Linda Lear Center gave me confidence… as well as built upon my skills… being able to see the results of our work on such a public and well-known domain, shows that our work as students is valued and relevant to scholarship; we don’t have to wait to enter the professional realm to have our work recognized. The work I did on Wikipedia will be looked at by hundreds of people even after the project is done, instead of just a paper that will only be read by my professor… I was surprised [by] how much it exposed me to new and constructive ways of research. The student found that knowing that their work would be read by a wide audience rather than simply by a professor for evaluative purposes was motivating. Moreover, the assignment introduced archival research and pushed them to delve into how what they were exploring in the archives could be put into conversation with other sources. For another student, “The Wikipedia project was difficult but it was one of the most important projects I have ever done for a class.” This student echoed a sense among many students that the assignment was higher in difficulty because of the effort required to collect, analyze, and create multiple representations of their findings. By the end of the semester, students recognized the value of learning how to create and share information with an audience beyond the walls of their institution. Sharing this project with a broader Digital Humanities community through blog posts and conferences produced further positive outcomes. For example, Alex Ketchum, feminist food scholar, tweeted that the description of this digital project at the Women’s History in the Digital World conference in part inspired her own digital project (Ketchum 2018). Each project adds to the network of possibilities, inviting conversations and collaborations that move ideas forward and create a rich community experience. The use of Wikipedia to develop an online presence for underrepresented archival collections offered a meaningful opportunity to generate greater access and exposure to these collections, as well as to create a valuable public-facing resource. Working with faculty and students provided an opportunity to examine collections through a feminist lens, bringing to a global audience the lives and histories of women with little public representation. Through multiple sections of the class, twenty-six entries were created on the work of women whose contributions ranged from environmental and labor activism to civic and institutional leadership. Each entry cites the Lear Center’s collections, increasing exposure of its archives and encouraging engagement on a global scale (Appendix 2). Staff contribution at each stage of the project emphasized the power and potential of collaboration. Archives staff worked with faculty to develop course outcomes and select appropriate collections, and provided an important support system for students throughout the project. Staff engaged students in the work of primary source research, helping them think through ways of structuring their entries, find additional sources, and cite material appropriately. The intensive one-on-one work opened important avenues for conversations about the complexities of archives and archival research, the ethical issues surrounding privacy, the gaps in our collections, and the resulting archival silences. The collaboration between faculty, students, archives staff, and Wiki Ed produced a successful project from both pedagogical and archival perspectives. It opened doors for students to engage deeply with feminist scholarship as they created content for Wikipedia on topics related to gender and sexuality. The topics chosen from within the archives were carefully selected to address gaps in Wikipedia. This approach led to important conversations with students about how sexist, racist, and other forms of bias are expressed in Wikipedia. As students became more confident as editors, they were able to identify and address more complex issues of bias: for example, the shortage of articles that focus on women and other underrepresented groups, the types of information certain articles emphasized, and the ways in which all that information was linked within Wikipedia. In individual meetings and in-class sessions, students discussed how these gaps are created and how their role as editors was vital in helping to fill them. Students also benefited from sharing their experiences with the Connecticut College community: they came to see themselves as knowledge-producers, educating others about the biases and gaps in Wikipedia, as well as about the potential of the platform. This project also provided a supportive environment for students to undertake archival work. By collaborating closely with archival staff, students experienced first-hand the complexities of archival research, engaging with archivists on issues of collection development, privacy, copyright, and gaps in archival records. In addition, the project generated opportunities for discussion about what materials from these collections could be used as citable evidence in Wikipedia articles. These exchanges made working in the archives a richer experience for students and staff. The ongoing pedagogical value of this project is clear to Connecticut College’s GSIS department. Now in its fourth iteration, under the direction of a new GSIS faculty member, the project has become a core component of the department’s approach to teaching feminist theory. This project is a flexible, extensible way for students to directly engage in feminist praxis, providing students with the opportunity to address real-world inequalities in Wikipedia and to consider how their own research is informed by feminist theory. The project has the flexibility to expand by incorporating the use of digitized collections from other institutions to explore topics and content not held in the Lear Center. This extension has exciting possibilities for students as they explore different collections and learn about the differences and similarities in using analog and digital collections. For faculty and archival staff, this project deepened an already positive working relationship and inspired further exploration of digital humanities work in other classes. Quotations in this section come from students’ reflection essays completed at the end of the Wikipedia assignment in Professor Rotramel’s courses in the fall of 2016 and 2017. Names are withheld to maintain student privacy. Anzaldúa, Gloria. 1991. “To(o) Queer the Writer—Loca, escritora y chicana.” In Inversions: Writing by Dykes, Queers, and Lesbians, edited by Betsy Warland, 249–61. Vancouver: Press Gang. Bayer, Tilman. 2015. “How many women edit Wikipedia?” WikiMedia (blog), April 30, 2015. https://blog.wikimedia.org/2015/04/30/how-many-women-edit-wikipedia/. Boboltz, Sara. 2017. “Editors Are Trying To Fix Wikipedia’s Gender And Racial Bias Problem.” Huffington Post, December 6, 2017. https://www.huffingtonpost.com/2015/04/15/wikipedia-gender-racial-bias_n_7054550.html. Collins, Patricia Hill. 1986. “Learning from the Outsider Within: The Sociological Significance of Black Feminist Thought.” Social Problems 33 (6): S14–S32. Davis, Lianna L. 2018. “Wikipedia and Education: A Natural Collaboration, Supported by Libraries.” In Leveraging Wikipedia: Connecting Communities of Knowledge, edited by Merrilee Proffitt, 87–104. Chicago: American Library Association. Doyle, Kelly. 2018. “Minding the Gaps: Engaging Academic Libraries to Address Content and User Imbalances on Wikipedia.” In Leveraging Wikipedia: Connecting Communities of Knowledge, edited by Merrilee Proffitt, 55–68. Chicago: ALA Editions. Gauthier, Maude, and Kim Sawchuk. 2017. “Not Notable Enough: Feminism and Expertise in Wikipedia.”Communication and Critical/Cultural Studies 14 (4): 85–402. Haraway, Donna. 1988. “Situated Knowledges: The Science Question in Feminism and the Privilege of Partial Perspective.”Feminist Studies 14 (3): 575–99. Harding, Sandra. 1992.“Rethinking Standpoint Epistemology: What is ‘Strong Objectivity?’” The Centennial Review 36 (3): 437–470. Head, Alison J., and Michael B. Eisenberg. 2010. “Truth Be Told: How College Students Evaluate and Use Information in the Digital Age.” Project Information Literacy Progress Report. Seattle: The Information School, University of Washington. hooks, bell. 1989. Talking Back: Thinking Feminist, Thinking Black. Cambridge, MA: South End Press. Ketchum, Alex (@aketchum22). 2018. “Last summer, I had the pleasure to be part of Women’s History in the Digital World #WHDW17. Panelists @rlprm & @AriellaRotramel, Elizabeth Novara + Leslie Fields.” Twitter, May 24, 2018, 4:51 p.m. https://twitter.com/aketchum22/status/999754907329662976. Lally, Ann M., and Carolyn E. Dunford. 2007. “Using Wikipedia to Extend Digital Collections.” D-Lib Magazine 13, no. 5/6, (May/June): http://www.dlib.org/dlib/may07/lally/05lally.html. Mackey, Thomas P., and Trudi E. Jacobsen. 2011. “Reframing Information Literacy as a Metaliteracy.” College & Research Libraries 72 (1): 62–78. McCann, Carole, and Seung-kyung Kim, eds. 2016. Feminist Theory Reader: Local and Global Perspectives. New York: Routledge Press. Moraga, Cherríe, and Gloria Anzaldúa, eds. 2015. This Bridge Called My Back. Albany, NY: SUNY Press. Moravec, Michelle. 2018. “The Endless Night of Wikipedia’s Notable Woman Problem.” b2o: an online journal. Naples, Nancy A., and Marnie Dobson. 2001. “Feminists and the Welfare State: Aboriginal Health Care Workers and U.S. Community Workers of Color.” NWSA Journal 13 (3): 116–37. Proffitt, Merrilee. 2018. Leveraging Wikipedia: Connecting Communities of Knowledge. Chicago: ALA Editions, the American Library Association. Scheinfeldt, Tom. 2010. “Stuff Digital Humanists Like: Defining Digital Humanities by its Values.” Found History (blog), December 2, 2010. Tally, Bill, and Lauren Goldenberg. 2005. “Fostering Historical Thinking with Digitized Primary Sources.” Journal of Research on Technology in Education 38 (1): 1–21. Wadewitz, Adrianne. 2013. “Wikipedia Is Pushing the Boundaries of Scholarly Practice but the Gender Gap Must Be Addressed.” LSE Impact Blog (blog), The London School of Economics and Political Science. April 9, 2013. Wiki Education. n.d. “About Us.” Accessed October 17, 2018. Wikipedia. 2018. “Wikipedia: Five Pillars.” Last modified September 15, 2018. Ariella Rotramel is the Vandana Shiva Assistant Professor of Gender, Sexuality and Intersectionality Studies at Connecticut College. Rotramel’s research and teaching interests include social movements, gender and women’s history, women and work, ethnic studies, queer and sexuality studies, community-based learning, and digital humanities and metaliteracy education. Rebecca Parmer is the Head of Archives and Special Collections at the University of Connecticut. She has previously held positions at Connecticut College, the USS Constitution Museum, and Northeastern University. Her research interests include exploring archival pedagogy in undergraduate and graduate education and examining the impact of inquiry- and project-based engagement in college and university archives. Rose Oliveira is the Linda Lear Special Collections Librarian at Connecticut College, where she preserves, describes, and provides access to the manuscripts, rare book, and art collections held by the college. She has previously held positions at Tufts University Digital Collections and Archives and The Arthur and Elizabeth Schlesinger Library on the History of Women in America at Harvard University. She holds a master’s degree in Library Science with a concentration in Archives Management from Simmons College in Boston. How do we incorporate technology into the contemporary classroom? How do we balance the needs of teaching literature with teaching students to use that technology? This article takes up “Digital Tools for the 21st Century: Sherlock Holmes’s London,” an introductory digital humanities class, as a case study to address these questions. 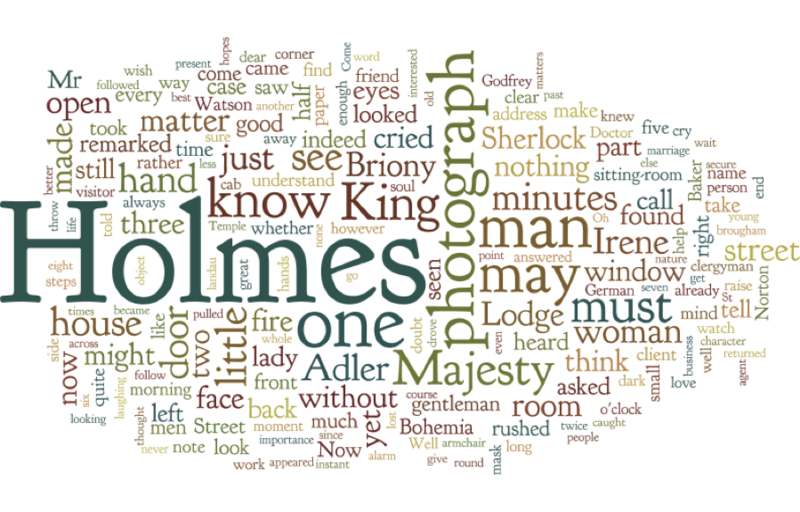 The course uses the Holmes stories as a corpus on which to practice basic digital humanities methodologies and tools, including visualizations, digital archives and editions, mapping (GIS), and distant reading, in order to better understand the texts themselves. This approach lets students find new patterns in well-known texts, explore the function of space in literature, and historicize their own technological moment. As Digital Humanities materializes in undergraduate classrooms, faculty face the problem of how to teach introductory methods courses: the umbrella term digital humanities covers such a wide array of practices—from building digital editions and archives to big data projects—that even defining the term is no easy task. For anyone trying to create an interdisciplinary digital humanities class, the challenges multiply: the course needs to be applicable to students in such diverse fields as History, English, Anthropology, Music, Graphic Design, or Education, all of which examine different corpora; yet it still needs a unifying concept and corpus so the students can see how applying concepts such as digital mapping or distant reading can spark new insights. To address these issues, I created “Digital Tools for the 21st Century: Sherlock Holmes’s London,” which uses Sir Arthur Conan Doyle’s Sherlock Holmes stories as a corpus on which to practice basic digital humanities methodologies and tools. The Holmes stories provide the perfect set of texts for a DH class, as they are flexible enough for us to use them in every unit: we use visualization tools (such as Voyant and word trees) to look for patterns in words and in sentence structure within a story, build a digital archive of Holmes artifacts, make TEI-encoded digital editions of Holmes stories, create maps of where characters travel, and topic model all 56 short stories to find thematic patterns. With this structure, students learn some of the most important digital humanities methodologies, analyze the Holmes stories from multiple perspectives, and use the character of Holmes as a model for both humanistic and scientific inquiry. The stories also facilitate an interdisciplinary approach: they touch on issues of gender, class, race, the arts, politics, empire, and law. This ensures that students from almost any field can find something relevant to their major. Perhaps most helpfully for this class, Holmes solves his cases not just through his quasi-supernatural cognitive abilities, but also through his mastery of Victorian technology, including the photograph, railroad, and daily periodicals. This focus on technology enables students to address the similarities between the industrial and digital revolutions: the anxieties that accompany the rise of blogs and Twitter echo Victorian concerns about the proliferation of print and periodicals, as both audiences were wary about the increased public voice such technologies could invite. These connections help students historicize their own technological moment and better understand both the Victorian period and the discourses around modern technology. The course begins with close-reading and discussion of four Holmes stories to introduce students to the central themes of the class and of Victorian studies, and we use these stories as our core texts with which we practice digital humanities methodologies, so students can see first-hand how visualizations, maps, archives, and distant reading can lead us to new interpretations. Teaching these methodologies, from digital archives to mapping, requires a tripartite structure that I have dubbed “Read, Play, Build.” First, students read articles from books and blog posts about the pros and cons of each methodological approach. They then examine current projects to discuss the ways each approach enhances scholarly fields and poses new research questions. Each unit concludes with an in-class lab component, in which students build small projects on the Holmes stories using a well-known tool and analyze the result. This structure ensures that students receive both theoretical and practical experience with each methodology and can see first-hand its strengths and weaknesses. This structure is particularly successful in the digital archives unit, in part because the Holmes stories themselves show the benefit of compiling archives: Holmes maintains an archive, or “index,” which he consults regularly. Watson explains its significance in the story “A Scandal in Bohemia,” which we read in class: “For many years he had adopted a system of docketing all paragraphs concerning men and things, so that it was difficult to name a subject or a person on which he could not at once furnish information” (Conan Doyle  2006, 5). Holmes’s compulsion to categorize and preserve is a central humanist task—we use and compile archives of our own (whether digital or physical) in the course of our research all the time—and in this story, we see Holmes using the archive to solve cases. After seeing the archive in action, used and compiled by one of the great fictional geniuses of Western literature, the students are more ready to build their own archives. Before building, however, we begin by examining a seminal work of archive theory: Jerome McGann’s 1996 essay, “Radiant Textuality.” From it, students learn how digital archives preserve works in danger of disintegrating, grant access to works from all over the world to make scholarship more equitable, and enable interdisciplinary and multimodal scholarship by including audio and video in ways that conventional print scholarship cannot. Students then examine McGann’s famous digital project mentioned in the article, The Rossetti Archive, which includes scans of every known painting, sketch, poem, manuscript, and translation produced by Pre-Raphaelite artist Dante Gabriel Rossetti, as well as essays on the importance and critical history of each item. Once the students have learned how to evaluate archives from their study of The Rossetti Archive, they apply this knowledge themselves by adding to a class archive of Holmes artifacts at holmesiana.net. This archive is powered by the content management system Omeka: a tool that lets people easily create websites without needing web design or development experience. Omeka is particularly useful for this project because, unlike other content management systems, it is specifically designed for curating digital collections of objects that resemble online museum exhibits. For this assignment, students choose three items related to Holmes (e.g. images, video or audio clips, or websites), upload them to the archive, group them into a collection, and then create an “exhibit,” or an essay that uses the items as illustrations. These exhibits range from analyses of portrayals of Irene Adler across multiple adaptations to discussions of the soundtrack in the Robert Downey Jr. Sherlock Holmes movie. This assignment does more than just teach students how to use a tool: it helps them see the broad appeal of Holmes stories, their role in contemporary popular culture, and, most importantly, the potential for digital tools to change the medium in which we make our scholarly arguments. We conclude our archive unit by using Book Traces, a tool invented by Andrew Stauffer at the University of Virginia. Book Traces collects examples of nineteenth-century marginalia, or traces of previous readers—including dedications, inscriptions, pressed flowers, newspaper clippings—from nineteenth-century books found in the stacks (not Special Collections) of college and university libraries. When users find these traces, they upload images of the traces (and transcriptions if possible) to booktraces.org, thus contributing to a crowdsourced archive of how nineteenth-century readers interacted with books. We work with Stephan Macaluso, a librarian at SUNY New Paltz, who teaches the students how to recognize Spencerian handwriting (as opposed to Copperplate or the Palmer Method) so students can figure out if the notes in the books were written before or after 1923. Students also learn how to identify notes written in steel-point pen or fountain pen compared with ballpoint to further aid them in dating the traces, before they are let loose in the stacks to find their examples. Even though only 2000 books in our library are from before 1923, my students have had great success finding items for Book Traces. For instance, one student found the book Shakespeare: The Man and his Stage with the inscription “To Barry Lupino . . . .a souvenir, Theatre Royal Huddersfield, July 16, 1923 from Alfred Wareing”: with some research, she was able to determine that Lupino was a British actor, and Wareing, a theatrical producer with a reputation for producing demanding productions and creating the Theatre Royal. From this, my student concluded that this book had been a gift from the producer to an actor in the production, and that the people involved in the production had used this book to influence their Shakespeare productions. During the course of this project in Fall 2015, my students uploaded the 400th unique volume into Book Traces, and were thanked by Andrew Stauffer himself over Twitter. This project has multiple benefits. First, it introduces students to the library. Many of my students are in their first semester of college and have never done research, been in the stacks, or looked for a book by call number, and Book Traces turns a library day into a fun and educational scavenger hunt. Book Traces also teaches students about the importance of libraries, even in a digital world: since so many books are digital and since shelf space is expensive, many libraries are forced to sell or destroy books that have free copies online. This project demonstrates why each book is important, and why it is not sufficient to have an online edition only. The assignment also encourages students to rethink their definition of a book: it is not merely the words of a story or poem, but the physical object itself, with all the marks that tell its history and highlight the differences in how nineteenth-century and modern readers used books and understood works of literature. Finally, the project lets students participate in a high-profile digital humanities project: they apply their learning outside the confines of the classroom by crowdsourcing, collaborating with each other and with a librarian, communicating directly with a well-known scholar, and creating new knowledge that will further scholarship on the nineteenth century. The class also uses simple visualization tools to learn more about Sherlock Holmes stories. For example, as an introduction to visualizations, students read articles about the pros and cons of word clouds. For any readers new to this phenomenon, word clouds are visualizations of word frequency in texts, in which words are larger the more times they appear. Students make word clouds of Holmes stories, write blog posts on their findings, and then discuss the results with their classmates. They have made several interesting observations, particularly with “A Scandal in Bohemia.” “Scandal” is the only work in the Holmes corpus involving Irene Adler, the only woman who outwits Holmes. Adler’s ingenuity causes Holmes to reevaluate his opinion of women: as Watson writes at the story’s end, Holmes “used to make merry over the cleverness of women, but I have not heard him do it of late” (Conan Doyle  2006, 15). One might imagine that a story that revolves around a woman and the worth of women would mention words related to women (such as “woman,” “women,” or “Miss”) at least as frequently, if not more so, than words relating to men, especially since the story begins and ends by foregrounding Adler’s gender. 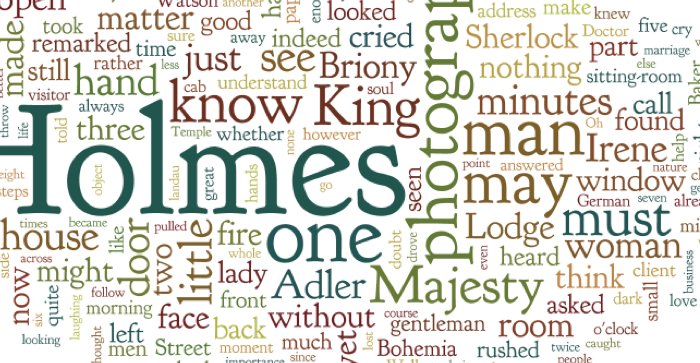 However, the word cloud actually shows that, although much of the narrative revolves around finding Adler and her photograph, the story contains far more references to men than to women: “men,” “man,” “Mr.,” and “gentleman” occur 45 times, whereas “woman,” “women,” “lady,” and “miss” occur 27 times. This difference suggests that, while the text focuses on one woman’s femininity, its sentences themselves focus more on the actions of men. 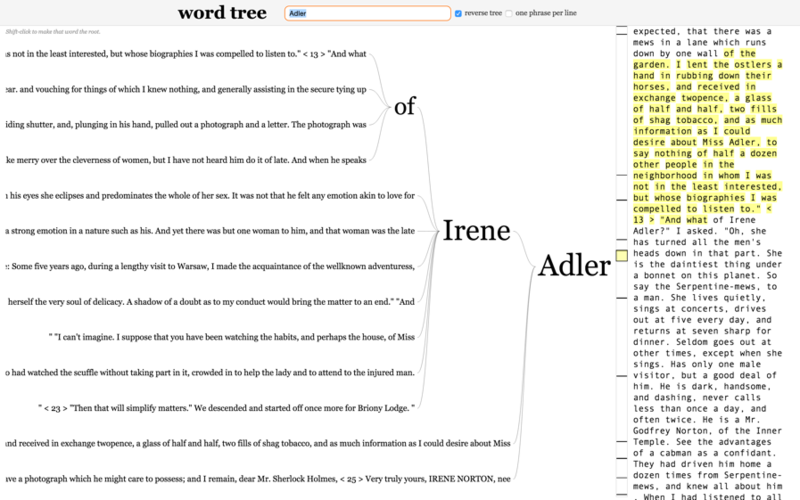 Students wanted to investigate gender in “A Scandal in Bohemia” at a more sophisticated level than a word cloud allows, so they switched to “word trees,” which, as Wattenberg and Viégas (2008) have explained, are “graphical version[s] of the traditional ‘keyword-in-context’ method [that] enable[…] rapid querying and exploration of bodies of text.” Word trees provide a more granular display of sentence construction and patterns by showing how particular words appear in context: users upload a text, search for a word, and are shown a visualization of the words that appear immediately before or immediately after that word in the text. 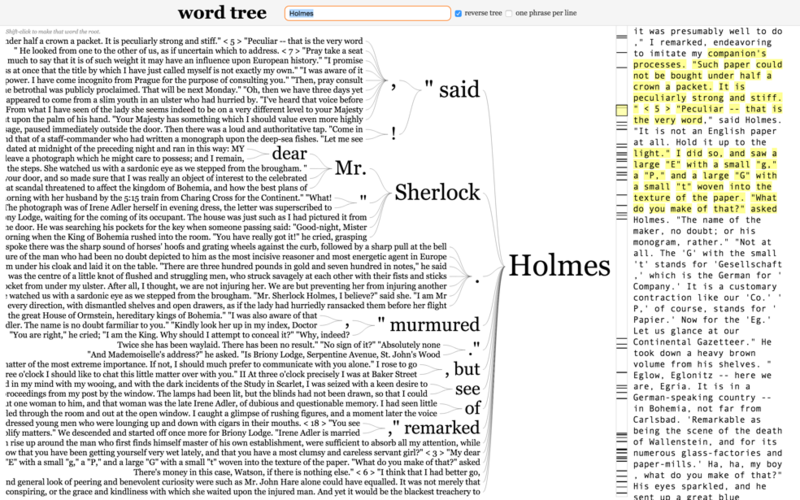 My students uploaded the text of “A Scandal in Bohemia” into Jason Davies’s word tree tool to compare how Conan Doyle used the words “Holmes” and “Adler.” For example, a search for “Holmes” demonstrates that his name is often followed by verbs of action: Holmes “whistled,” “caught,” “laughed,” “scribbled,” “dashed,” “rushed,” “staggered,” etc. Essentially, then, Holmes is characterized by his movements and actions in the story, even though his actions end up being fruitless, as Adler evades him. The word “Holmes” is often preceded by “said,” “remarked,” “asked,” or by the rest of his name and title (e.g. “Mr. Sherlock Holmes”). Syntactically, then, throughout the story, Holmes is associated with his actions and speech, and has a high degree of agency. A search for “Adler,” however, shows that her name is only followed by a verb once: the word “is” (in the phrase “is married”). Even though she, like Holmes, takes action repeatedly in the story, those actions are not syntactically associated with her name, and in fact, her action is technically associated with losing her name (as she becomes Norton rather than Adler). “Adler” is most frequently followed immediately by punctuation: a question mark, commas, and periods. Unlike Holmes, then, her name is syntactically associated with pausing and stopping, and thereby with silence and passivity. When we reverse the tree and see what comes before “Adler,” we see that every instance is about her name: “Adler” is always preceded by “of Irene,” “Irene,” “Miss,” or “née” (as in “Irene Norton, née Adler). Again, unlike Holmes, whose name was prefaced by words associated with speech (and only sometimes with his full name), Adler is linked to her name only, and not her words, which again decreases her agency and actions. From these visualizations, we can see that, while the story does feature a proto-feminist plot, in which an intelligent, remarkable woman defeats Holmes, its sentence structure does not endorse that standpoint. Instead, the sentence construction renders Adler as a passive figure whose agency is only exercised in marriage. Word trees help us complicate the conventional feminist interpretation of the text. Visualization technologies can illuminate more than patterns in sentences: they can also provoke new insights about geography in texts. Holmes stories lend themselves to spatial analysis, as they are very invested in locations: Holmes, Watson, and the criminals they track down often travel across London and beyond, and the stories painstakingly describe the paths they traverse. “The Blue Carbuncle,” for example, mentions the exact streets Holmes and Watson walk through en route to Covent Garden. However, many students have never been to London, and they know even less about areas of London in the nineteenth century. To address this, students read articles about GIS (Geospatial Information Systems) to understand how digital mapping projects require plotting data on maps and looking for patterns, rather than just digitizing historical maps. Then, they learn how to use a number of nineteenth-century mapping projects: “The Charles Booth Online Archive” is a digitized, searchable version of Booth’s poverty maps that let users see the income level of each area of London; “Locating London’s Past” lets users map crime data from the Old Bailey archive in addition to data on coroners’ records, poor relief, and population data; “London Buildings and Monuments illustrated in the Victorian Web” includes images and descriptions of various London landmarks; and “Mapping Emotions in Victorian London” maps positive and negative emotions associated with streets and landmarks in London from passages in nineteenth-century novels. Students then choose a location from one of the Holmes stories we discussed in class, research it using previously mentioned websites to compare Conan Doyle’s fictionalized account of the area with the historical spot, and then map the locations with either Mapbox or Google Maps and look for patterns. They analyze the connections and often come up with interesting results. For example, one student considered the significance of Leadenhall Street in “A Case of Identity.” In that story, a wine importer (Mr. Windibank) disguises himself in order to court and then abandon his stepdaughter at the altar so she would be heartbroken and never marry, and he could live off of the interest of her inheritance. The fake fiancé claimed to work in Leadenhall Street and had the stepdaughter address her letters to him to the post office there. One student’s research showed that Leadenhall Street was the headquarters of the East India Company until it was disbanded in 1861, and this prompted her to observe parallels between the former East India Company and Mr. Windibank: both were importers of foreign goods, both were very invested in profits, and both acted cruelly to obtain those profits and to control others. Consequently, what initially seemed to be a small, insignificant geographic reference turned into a detail that illuminated a character’s moral failings and also a larger political argument. These small-scale research projects are equally illuminating for fictional locations: students also realized that, in “A Scandal in Bohemia,” all streets or locations most associated with Irene Adler are fictional, whereas all other landmarks in the story existed. This discovery prompted a passionate discussion about geography and feminism in the text: students debated whether Conan Doyle was trying to avoid being sued for libel, to claim that an intelligent women like Adler could never really exist, or to dramatize Adler’s ability to slip through Holmes’s fingers by having her slip through our own (since she can never be mapped). Without these mapping technologies, students wouldn’t realize the ways in which questions of geography are inextricably related to class, gender, and other political issues. The Sherlock Holmes focus is useful beyond its application to visualization and spatial analysis: the character of Holmes himself provides a valuable introduction to the history of technology and close-reading. In “A Case of Identity,” for instance, Holmes proves that the stepfather is the criminal and that the stepfather and the missing fiancé are the same person by examining typewritten letters sent by both, in which certain print characters had the same idiosyncrasies due to wear and tear on the keys: as Holmes says, “a typewriter has really quite as much individuality as a man’s handwriting. Unless they are quite new, no two of them write exactly alike. Some letters get more worn than others, and some wear only on one side. . . [I]n this note . . . in every case there is some little slurring over of the ‘e,’ and a slight defect in the tail of the ‘r’” (Conan Doyle 1891, 14). This quotation not only shows how technology solves the case, but also how, even within the mechanical, the human (and humanist) shines through. Other Holmes stories likewise unite Victorian technology and writing: in “The Blue Carbuncle,” Holmes tracks down the owner of a Christmas goose (and missing bowler hat) by advertising in widely-circulated Victorian newspapers, specifically the “Globe, Star, Pall Mall, St. James’s, Evening News Standard, [and the] Echo” (Conan Doyle 1892, 8), papers whose distribution was only made possible by advances in paper and printing technology. Throughout the Holmes canon, then, cases revolve around Victorian technological advances because of how dramatically these innovations changed forms and methods of communication. To modern readers, and especially to students, these inventions hardly seem to count as technology, because “the technological” today is so often synonymous with “the digital.” The Holmes stories function as a corrective to that attitude: they encourage students to rethink their definition of “technology” to better understand the Victorian period as well as their own time. Holmes’s facility with technology also furthers our image of Holmes as an expert thinker: his observational skills and “deductive reasoning” are already famous in popular consciousness. He repeatedly insists on the scientific method and the importance of unbiased data gathering, famously saying in “A Scandal in Bohemia,” “It is a capital mistake to theorize before one has data. Insensibly one begins to twist facts to suit theories, instead of theories to suit facts” (Conan Doyle  2006, 3). Consequently, Holmes becomes a useful model for a digital humanist, especially when students may be unused to thinking about data in a humanities context. In spite of his emphasis on scientific reasoning, Holmes is, at heart, quite the humanist. In addition to his love of the violin, opera, theater, French literature and archiving, Holmes also provides students with a metaphorical model of a close reader; this can be especially useful when teaching an interdisciplinary class full of students for whom close reading is a confounding, magical process. One particular passage, from “The Blue Carbuncle,” helpfully dramatizes Holmes’s analytical abilities. When examining a bowler hat, he first makes pronouncements about it, and then breaks down the close-reading process, explaining each step: “This hat is three years old. These flat brims curled at the edge came in then. It is a hat of the very best quality. Look at the band of ribbed silk and the excellent lining. If this man could afford to buy so expensive a hat three years ago, and has had no hat since, then he has assuredly gone down in the world” (Conan Doyle 1892, 4). To Watson (in this metaphor, the non-English major), it seems almost magical that someone could get so much meaning from such a small object (in this metaphor, the paragraph). And yet, by observing the style, the band, and later the hair and the size, and comparing those observations to his mental repository of expected characteristics and actions for people, Holmes figures out who must have owned the hat, much as we observe imagery patterns, sentence construction, and other narrative devices and compare them to our repository of genre or stylistic expectations to come up with a reading of a paragraph (or work as a whole). Sherlock Holmes, then, brings together the humanities, the sciences, and the technological; the local and the global; and, in the classroom, the past and the present. Although we only read a small subset of the Holmes stories, they provide the perfect corpus for working across disciplinary boundaries, including History, Literature, Gender and Sexuality Studies, Sociology, Law, and Anthropology. As they are short stories, they are the perfect length for courses that contain students from majors beyond English, and their comparative brevity enables us to devote more time to the theoretical and practical import of digital humanities methodologies. Teaching Holmes stories with digital tools lets students build on the traditional humanities skills of close-reading, noting patterns, and using archives. It augments that scholarly toolkit by guiding students to a better understanding of rhetorical patterns and spatial significance, while also introducing them to techniques that have broad applications in their own fields beyond the nineteenth-century focus of this class. The stories’ own investment in technology lays the groundwork for the course’s own technological focus, and this enables us to thematically tie together the digital humanities methodologies with the Victorian works we study. Naturally, this project has its challenges: for instance, students from the so-called “digital native” generation are often anything but. While some have specialized computer skills, including video editing or programming, most have only minimal experience, such as word processing or social media. Few have built their own projects, experimented with currently existing digital tools, or thought about how digital technologies can challenge conventional traditions of scholarship. Most students find digital technology intimidating, as they are aware of the limits of their knowledge and are afraid to experiment enough to figure out how programs work—an aspect of trial and error necessary to excel in digital humanities. To overcome these hurdles, I provide my students with detailed instructions, both written and verbal, for every lab day, and I meet outside of class with any students who need additional support. I also model trial and error throughout the semester: if a tool or project produces errors the first time, I explain the reasons I think it might be glitching and then walk them through the troubleshooting process (which often involves Google searches) so they can have the skills and confidence to try to address any stumbling blocks that might arise. I also update the syllabus each time I teach the course: for instance, I cut a unit on topic modeling the Holmes stories and graphing the results when I realized that students needed a comfort level with history and complex visualizations that was greater than I could provide in two weeks. I look forward to making additional alterations to the course as the field of digital humanities changes and new tools and methodologies become available. The most recent incarnation of “Digital Tools for the 21st Century: Sherlock Holmes’s London,” from Fall 2015, has a course website that includes the syllabus, assignments, grading rubric, and student blogs; I hope they inspire others to borrow or build on my ideas. The approach can easily be adapted to a wide range of literary periods and authors, and is especially suited to works that reference real places and historical events, and works that have become part of pop culture. This structure teaches students history, literature, and technology in greater depth and with a greater degree of interaction and intellectual curiosity than often occurs in traditional classroom. As a class, we’re building an archive of items related to Sherlock Holmes stories (http://holmesiana.net/). Each student will contribute three related items, one collection (with your 3 items), and one exhibit (with a 300-word essay on the items) to the archive. Due 9/21 by 9:30am: Accept the Omeka invitation, create an account, and bring three related digital items for inclusion in a Holmes archive. Due9/25 by 8pm: Add three items, 1 collection, and 1 exhibit that contains a 300-word essay using the objects you added as images. Post links to the items, collection, and exhibit to the class blog. These items can be anything at all: illustrations from the original Holmes stories, photographs of locations mentioned in the stories or of props in the movies, images of movie or TV show posters of adaptations, pictures of games based on Holmes, audio clips of theme songs of different Holmes adaptations, video clips of the credit sequences of different adaptations, etc. The only requirements are that the items involve Holmes and that you have the permission to put them online. You CAN: use material from an official account (BBC, MGM) as long as you include a link (the image/clip URL) to the source. For each item, you must write down the Title, Subject, Description, Creator, Publisher, a URL, and Item Type. Check your email and look for an email from “A Study in Holmesiana Administrator vs hotrods.reclaimhosting.com <swafforj@newpaltz.edu>” with the subject heading is “Activate your account with the A Study in Holmesiana repository.” NOTE: Check your spam folder. It will probably be there. Open the email and click the link inside. You will be asked to create a password. Type your username (written in the email) and password to log in. From your items page (net/admin/items) click the “Add an Item” button. This takes you to the admin/items/add page where you see a navigation bar across the top pointing you to different stages of adding an item. The first tab shows the Dublin Core metafields. Enter the Title, Subject, Description, Creator, and Publisher information. The Item Type Metadata tab lets you choose a specific item type for the object you are adding. Once you choose the type by using the drop-down menu, relevant metadata fields appear for you to complete. If you have an image, select “Still Image” and put the URL of your image in the “External Image URL” field. If you have a video, choose “Moving Image” and paste the embed code for the player in the “Player” field. Don’t know how to get the embed code? Follow these instructions. The Files tab lets you upload files to an item. If you have an image, upload your image by clicking “Choose File” and selecting the file. If you have a video from YouTube, you’ll need to make an image. Copy and paste the YouTube URL from the top of the webpage into this website, right-click on the image labeled “Normal Quality,” save it to the Desktop, and then upload it to Holmesiana.net through the Files menu. The Tags tab allows you add keyword tags to your item. Next, you’ll group your items into a collection based on a similar theme. Click on the “Collections” tab in the /admin interface top navigation bar. Any collections you create will be listed on the /admin/collections page. Name and describe your collection. Click the “Public” checkbox to make this collection visible to the public. Be sure to click “Save Collection” to save your newly created collection. Open an item you want to add to the collection. To the right of the page, under the “Add Item” button is a drop-down menu where you can assign your item to a collection. Remember, items can only belong to one collection. Be sure to click the “Add Item” button to save your data. Click on the Exhibits tab in the top nav bar of the Admin interface, and click the “Add Exhibits” button on the right side. You will arrive at an Exhibit Metadata page. Fill in the empty fields. Exhibit Title: This is the title of the entire exhibit (e.g. “Irene Adler in Adaptations”). Exhibit Credits: These will appear with description on the public site. Put your name here. Exhibit Description: Write a brief introduction to the entire exhibit that appears on the public site. Exhibit Tags: Tags help associate exhibits with other items in your archive. Exhibit is featured: Leave this blank. Exhibit Theme: By default, “Current Public Theme” is selected. DO NOT CHANGE THE THEME. Use Summary Page: Uncheck the box. This will get rid of a title page for your exhibit. Give your page a title and a slug (e.g. “Adler Adaptations” for the title and “adler” for the slug). Next, you choose the layout for your exhibit. Since you’ll be writing 300 words about the objects in your archive, you’ll want to select “File with Text.” This lets you include images and a description about them. Now, you’re ready to add your text and items. Type your text about the first item in the box labeled “Text” below. Click on the arrow next to the words “Layout Options.” Adjust the drop-down menus to change the position and size of your image. Repeat steps 5-9 for each item in your exhibit. Remember to click “Save Changes” frequently. Congrats! You made an exhibit! Click “Save Changes” one last time, then go to http://holmesiana.net, click “Browse Exhibits,” and find yours. Click on it and make sure you’re happy with how it looks. Search the library catalogue for books published between 1820-1923 from the library stacks (not special collections) based on a certain topic (see list of topics below). Look through these books to find one with marginalia (annotations or marks) or inserts from the 19thcentury. Take pictures of up to five instances of marginalia or inserts in the book, fill out the information about your book and its marginalia, including the “description” field, on http://www.booktraces.org/, upload your photos, and submit your entry. NOTE: If you have looked through 20 books from the 19th century without finding marginalia, you may stop searching, but you must still write a blog post. If you can’t find any traces of previous readers, explain what search terms you used to find 19th century books, give some sample titles of books you looked at, and give some guesses about why books with your selected topic do not include any evidence of earlier readers. The blog post and Book Traces submission are due by 9/30 by 8pm (6% of final grade). USEFUL TIP: Book Traces states that participants have had the most luck finding markings in books from the PR or PS call numbers (British and American Literature), but it also recommends French and Spanish literature, history, religious texts, and philosophy. Marginal notes, inscriptions, owner’s names, any other type of writing, drawing, bookmarks, inserts, clippings pasted into the book, photos, original manuscripts, letters. In class, you’ll be split into three groups that correspond to the four Holmes stories we’ve read this semester. Choose a location from the Holmes story you’ve selected, research it using online scholarly sources on Victorian London, and write a blog post about how and why that background information about the location affects our understanding of the story. Choose one spot (not Baker Street) mentioned in the Holmes story you signed up for. Do a search for your street this digital map of Victorian London (http://maps.nls.uk/geo/explore/ – zoom=12&lat=51.5021&lon=-0.1032&layers=163) and then zoom in and take a screenshot. c. Include screenshots and any other pictures you’ve found that you think will be helpful. Conan Doyle again critiqued the East India Company’s unethical imperial project in a later work, The Mystery of Cloomber, set during the First Afghan War. In it, a Major-General in the East India Company massacres a group of Afridis on holy ground, and is punished for his crime years later. Conan Doyle, Arthur. 1892. “The Adventure of the Blue Carbuncle.” The Strand Magazine 3 (13): 73-85. Internet Archive. Accessed October 15, 2015. https://archive.org/details/StrandMagazine13. Conan Doyle, Arthur. 1891. “A Case of Identity.” The Strand Magazine 2 (9): 248-259. Internet Archive. Accessed October 15, 2015. https://archive.org/details/StrandMagazine9. Conan Doyle, Arthur. (1891) 2006. “A Scandal in Bohemia.” Facsimile reproduction of The Strand Magazine 1: January 27, 2006. Stanford: Stanford Continuing Studies. Accessed October 15, 2015. http://sherlockholmes.stanford.edu/pdf/holmes_01.pdf. McGann, Jerome. 1996. “Radiant textuality.” Victorian Studies: An Interdisciplinary Journal of Social, Political, and Cultural Studies 39 (3): 379. Wattenberg, M., and F. B. Viégas. 2008. 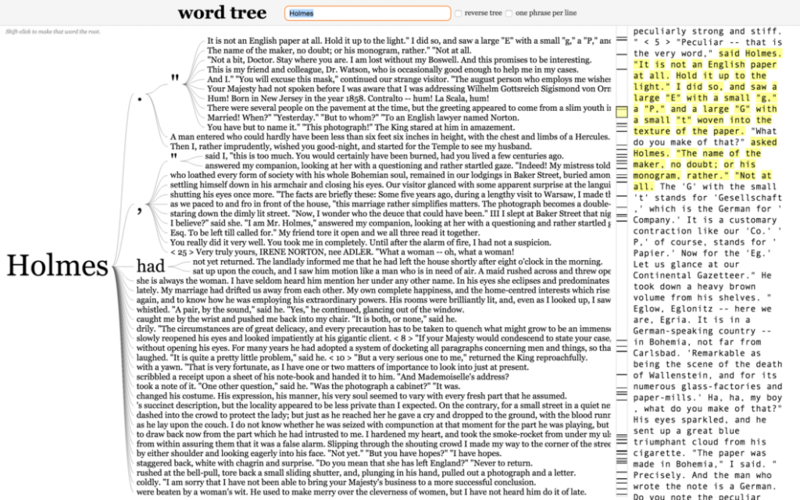 “The Word Tree, an Interactive Visual Concordance.” IEEE Transactions on Visualization and Computer Graphics 14 (6): 1221–28. doi:10.1109/TVCG.2008.172. 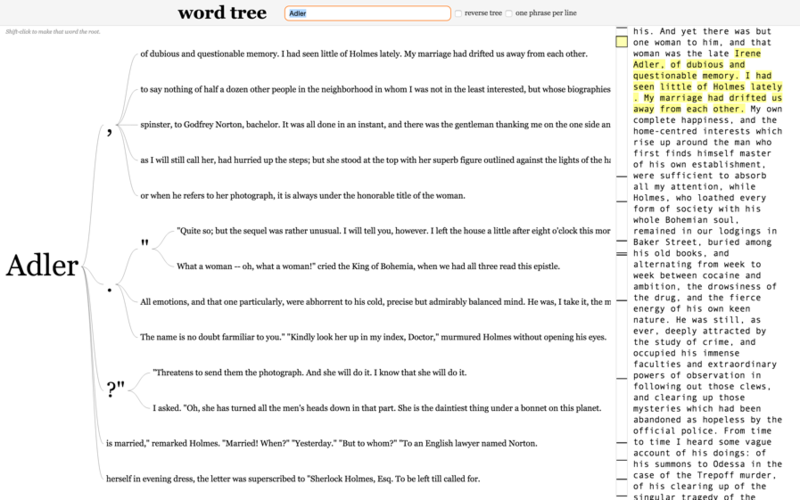 Accessed October 15, 2015. http://hint.fm/papers/wordtree_final2.pdf. Joanna Swafford is the Assistant Professor for Interdisciplinary and Digital Teaching and Scholarship at SUNY New Paltz, specializing in Digital Humanities, Victorian Literature and Culture, Sound, and Gender Studies. Her articles have appeared or are forthcoming in Debates in Digital Humanities, Provoke! : Digital Sound Studies,Victorian Poetry, and Victorian Review. She is the project director for Songs of the Victorians (http://www.songsofthevictorians.com/), Augmented Notes (http://www.augmentednotes.com/), and Sounding Poetry, and is the co-founder and coordinator of DASH (Digital Arts, Sciences, and Humanities) Lab at SUNY New Paltz. She is also Head of Pedagogical Initiatives for NINES.org (Networked Infrastructure for Nineteenth-Century Electronic Scholarship). This essay focuses on a property disposal website run by the General Services Administration (GSA). The website inadvertently grants intimate access to Cold War–era buildings and built environments that were previously “Off Limits” to civilians, including students and scholars of Cold War history. I begin the essay by discussing the heavy building that occurred within the mainland US during the Cold War era and explain why, in the 1990s, US policymakers suddenly came to view themselves as having too much defense-related property. I then discuss the online auction website currently used by the GSA to dispose of Cold War properties and outline the website’s key features. I also provide an example of a large military base in California that was sold through the GSA’s website and subsequently re-developed for new and unrelated purposes, a process that many architects and planners call “adaptive reuse.” In Part 2 of the essay, I explain how the GSA property disposal website can be used for teaching purposes despite its intended goal of serving private land developers. In my discussion, I borrow the term “adaptive re-use” and elaborate it into a digital humanities concept. The Cold War era (1940s–1980s) was a time of heavy building within the mainland United States. The construction of the interstate highway system, which in part began as a civil defense scheme, fueled the rapid decentralization of American cities and mass suburbanization. Large defense contracts spawned countless new science, engineering, and manufacturing facilities dedicated to defense-related research. The US federal government also built a considerable number of military bases. From the 1940s to the 1980s, there were nearly 200 military bases constructed in the mainland US (Chambless 1998, 102). Although more commonly remembered as a geopolitical and cultural event, the Cold War was also a significant moment in the history of American architecture and infrastructure. The Cold War unfolded through built space and transformed the US landscape. A growing fascination among US policymakers with the idea of computer-mediated warfare and the dissolution of the USSR in the early 1990s altered the US government’s perceived needs in terms of keeping and maintaining defense-related property.1 By the last decade of the twentieth century, the US had lost its principal geopolitical rival, and civil defense seemed on the verge of virtualization. As a result, the 1990s saw a rapid reduction in the heavy building of the Cold War era, and much of the defense-related property built during the Cold War came to be re-conceptualized as unnecessary and surplus.2 To this end, the Department of Defense began actively selling off many Cold War–era properties to private land developers, a process that continues in the present day. The developers commonly demolish the properties or adapt them for new and unrelated purposes. Every day, more Cold War sites are torn down, demolished, and then re-built and reused—sometimes leaving little to no record of their existence. Architects and planners commonly call this type of property re-development “adaptive reuse.” Other common examples of adaptive reuse include the conversion of power plants into art galleries, factories into residential lofts, and abandoned box stores into small clinics or hospitals. The practice of adaptive reuse has gained currency in the building and planning professions for several reasons: cost and time-saving possibilities that can be gleaned (but not always) from adapting an existing site for new purposes instead of building from scratch; a growing interest in sustainable building practices that conserve land and resources by mitigating new construction; and an attraction to the distinctive challenges that many adaptive reuse projects present to builders and planners who understand themselves to be in creative, problem-solving industries (Coffey 2004, 56-7; Shipley, Utz and Parsons 2006, 505-520; Hunter 2007, 10, 13-14). Adaptive reuse has been called an “art form with a cause” (Coffey 2004, 56). The practice often has an environmental, aesthetic, and economic politics to it. In this essay, I borrow the term “adaptive re-use” and elaborate it into a digital humanities concept. My focus here is the Real Property Utilization and Disposal Website used by the General Services Administration (GSA) to sell off Cold War–era properties to private land developers. 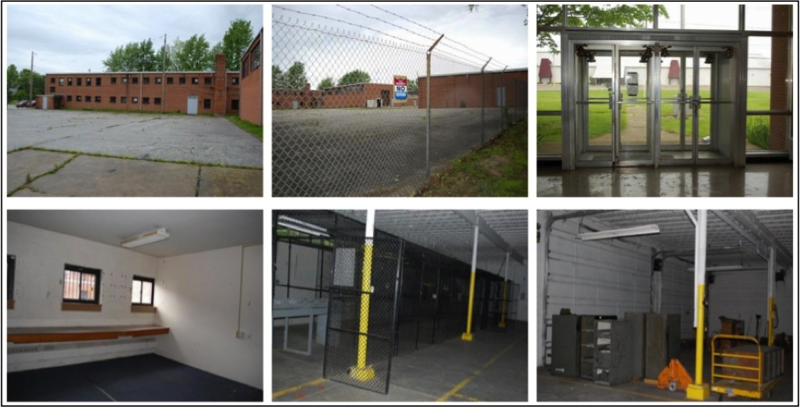 The GSA’s property disposal website allows potential buyers to browse through a wide variety of aging defense architecture. Visitors to the website can search for properties by state, property type, or region using simple dropdown menus (see Gallery 1). Visitors can also move through image galleries and obtain detailed property information. Gallery 1. Screen captures from the GSA’s property disposal website. Accessed August 26, 2012. The website auctions everything from office buildings, bases, hospitals, test facilities, laboratories, garages, patrol stations, and warehouses to empty lots, silos, parking lots, and checkpoints. In doing so, the website inadvertently grants intimate access to Cold War–era buildings and built environments that were previously “Off Limits” to civilians, including students and scholars of Cold War history. For example, Figure 1 shows a former army reserve facility in suburban Cleveland that was initially built between 1958 and 1962. Vacated in 2008, the army facility was auctioned off through the GSA’s property disposal website in the spring of 2012. As is typical of the website’s design, prospective buyers were able to access a series of image galleries during the auction process in a manner that simulates a visit to the property in person. Figure 1. Screen capture from the GSA’s property disposal website. Army reserve facility in Cleveland. Accessed August 26, 2012. Although seemingly abandoned, the properties listed on the GSA’s property disposal website are often contested places with complicated individual histories. A good example can be found in the case of El Toro Marine Corps Base in Orange County, California. Opened in the 1940s, the federal government targeted the base for closure in the early 1990s. Local officials initially aimed to convert the base to a sizeable commercial airport. After generating considerable anti-airport activism, the project eventually unraveled when a series of ballot measures designated the land for non-aviation use.3 In 2005, a capital investment partnership led by Lennar Corporation acquired the entire El Toro lot through the GSA website with a combined winning bid of $650 million (USD). The initial redevelopment plans for the former military base included 3,500 new homes, 28,000 square meters of retail and office space, a research and development corporate office complex, a set of university branch campuses, a 45-hole private golf course, and a massive public park (Lennar Homes of California, Inc. 2005).4 As part of these re-development efforts, a San Diego recycling company contracted by Lennar and a local NGO dismantled many of the installation’s 1,200 buildings and structures—trucking the doors, floors, windows and wood to nearby Northern Mexico as part of a transnational development project (Rowe 2006). In 2007, I went to Orange County to conduct fieldwork and to document El Toro’s disassembly (see Gallery 2). Within months of my fieldwork, most of the buildings were unrecognizable, stripped, or gone. Gallery 2. The disassembly of El Toro Marine Base. Photographs by author. In the following section of this essay, I shift my attention from documenting processes of physical disassembly to thinking about digital making and re-making. Specifically, I explore how the GSA property disposal website used to sell El Toro and similar properties might be used for teaching purposes despite its intended goal of serving private land developers. My claims are the following: (1) the GSA’s property disposal website provides unique and free Cold War content; (2) it functions like an authentic, albeit buggy, beta version of a digital archive documenting Cold War–era buildings and built environments. Therefore, (3) like the very properties the GSA website features, the website itself is open to “adaptive reuse” into a more properly functioning digital archive geared toward students and scholars of Cold War history. Thematically, the content within the GSA’s website connects to much of the recent scholarship in Cold War studies, including work on Cold War ruins, work on Cold War geographies, work on elite, off-limits, and technical spaces, work on Cold War domestic environments, and comparative work on “imperial debris.”5 The website makes visible the physical leftovers of abstract geopolitics. Given the content of the website, my discussion here is largely aimed at instructors working in history, anthropology, and allied fields who incorporate digital humanities training into their classrooms. My larger goal, however, is to use this particular case to also expand the idea of “adaptive reuse.” To put forth a working definition: adaptive reuse involves having students assess other people’s digital tools and then work on modifying those tools into scholarly works, resources, or products. The adaptive reuse proposed here can be carried out in three separate steps. Step 1. The first step of any adaptive reuse project should likely be assessment. The assessment process can be structured as an in-class, group activity or as an individual assignment. Assessment involves asking students to think about the following: What content or services does the digital tool in question currently provide to, or perform for, its users? What features would need to be added, modified, or removed to make the digital tool in question recognizable and functional as an academic entity? In the case of the Real Property Utilization and Disposal Website, the website freely provides original content by inadvertently exhibiting some of the built spaces in which the everyday work of the Cold War happened—capturing the moment just before many of those spaces are sold, redeveloped, and possibly lost from the records. However, the designers of the GSA website organized its search features with property buyers and investors in mind, not students and scholars of Cold War history. In fact, the GSA’s website categorizes each property by its current zoning status and future possible uses (e.g. commercial, industrial, residential), not by its past uses, and certainly not by its potential academic value. Moreover, the Cold War–era properties are mixed together on the website with other surplus government real estate, like old lighthouses and post offices. There are currently no filters that allow users to view only the Cold War–era buildings and built environments. In addition, the GSA website does not currently archive its auctions. Visitors to the website can only view ongoing and upcoming auctions; they cannot access records for properties that were previously sold. These types of observations are what students might draw out during the assessment process. In this particular case, much of the content featured on the GSA’s website has obvious academic value but the design of the website makes that content difficult to use and share for academic purposes. Step 2. The second step of this adaptive reuse project would be to have students work on adapting the digital tool in question. Depending on the technical proficiency of the students and equipment availability, students might produce mock-ups on paper, write proposals, create wireframes, or actually take up the challenge of adapting the tool for academic use. In the case of the Real Property Utilization and Disposal Website, the work required to turn the website into a functional digital archive geared toward students and scholars of Cold War history might include the following: cataloguing properties based on their past use instead of current zoning status; creating new search features predicated on scholarly terms and interests; building filters for the properties to prevent unrelated government real estate from being intermixed with the Cold War–era buildings and built environments; developing a means to archive the website’s content; developing a means to allow visitors to comment on properties or to create their own image and data galleries; making space for interpretive essays, discussion, or commentary; addressing the stewardship and preservation issues when it comes to digital content; or adding a bibliography that directly connects the website to recent scholarship in Cold War studies—to offer just a few examples. Step 3. The third step of this particular adaptive reuse project would be to have students present their work and to reflect upon the creative challenges that are specific to adaptation. If the students produced mock-ups or proposals, they can still demonstrate technical proficiencies by addressing how those ideas might be implemented, and by discussing feasibility. If students actually took up the challenge of adapting the tool in question for academic use, the opportunity to present their adaptation(s)—be it one small component or a complete and working tool redesign—affords them the opportunity to explain their initial plans, to outline the work completed, and to generate observations about working in, through, and upon decisions and designs previously made by others. Students might also be asked to consider whether adaptive reuse has a politics to it when performed within the context of the digital humanities. Beyond the skill-building aspects of this type of assignment, might it too be an “art form with a cause” that has aesthetic, environmental, or economic stakes? Because the purpose of the GSA’s property disposal website is to aid the US federal government in the process of auctioning off surplus properties, it is designed to suit the needs of potential property buyers. It therefore allows visitors to move through image galleries and obtain detailed property information. But the GSA website can also be re-envisioned as an incomplete digital archive, and rediscovered as a potential site for scholarly and pedagogical projects. As such, like the very properties the GSA website features, the website itself is open to adaptive reuse. Adaptive reuse projects like the one proposed in this essay offer the potential to scaffold digital humanities training by adding new levels of challenge and practice. Given that many digital humanities projects being developed in the present day will age and thus require, over time, episodic retooling, “adaptive reuse” also has the potential to grow as a digital humanities concept from a level of practice, as described and proposed here, to a specialized area of design knowledge, skill, and expertise. Adapting other people’s digital tools can be a key part of the process of learning how to make one’s own. It might also become the very thing that helps sustain the digital humanities over time by mitigating obsolescence, conserving resources, and creating the possibility for new types of tool aesthetics, layerings, and politics. Castillo, Greg. 2010. Cold War on the Home Front: The Soft Power of Midcentury Design. Minneapolis, MN: University of Minnesota Press. OCLC 351318481. Chambless, Timothy M. 1998. “Pro-Defense, Pro-Growth, and Anti-Communism: Cold War Politics in the American West.” In The Cold War American West, edited by Kevin Fernlund. Albuquerque, NM: University of New Mexico Press. OCLC 39069512. Coffey, Daniel P. 2004. “Adaptive Re-use.” Contract 46: 56-57. ISSN 1530-6224. Farish, Matthew. 2010. The Contours of America’s Cold War. Minneapolis, MN: University of Minnesota Press. OCLC 617508692. Gray, Chris H. 2003. “Posthuman Soldiers in Postmodern War.” Body & Society 9: 215-226. OCLC 438108206. Hunter, Pam. 2007. “Saving Time and Money with Adaptive Re-use Projects.” Design Cost Data 51: 10, 13-14. http://www.dcd.com/insights/insights_jf_2007.html. Kaiser, David. 2004. “The Postwar Suburbanization of American Physics.” American Quarterly 56: 851-888. OCLC 608755840. Komska, Yuliya. 2011. “Ruins of the Cold War.” New German Critique 38: 155-180. OCLC 701896732. Krasner, Leonard. 2002. Internet for Activists: A Hands-on Guide to Internet Tactics Field-tested in the Fight Against Building El Toro Airport. San Jose, CA: Writers Club Press. OCLC 53891514. Lennar Homes of California, Inc. 2005. “Lennar and LNR Place Winning $650 Million Bid for All Four Parcels of El Toro Marine Base, California.” News Release, February 17. Lockwood, David E. and George Siehl. 2004. Military Base Closures: A Historical Review from 1988 to 1995. Washington D.C.: Congressional Research Service, Library of Congress. Masco, Joseph. 2006. Nuclear Borderlands: The Manhattan Project in Post-Cold War New Mexico. Princeton, NJ: Princeton University Press. OCLC 61151373. ———. 2008. “‘Survival is Your Business’: Engineering Ruins and Affect in Nuclear America.” Cultural Anthropology 23: 361-398. OCLC 438095863. O’Mara, Margaret Pugh. 2006. “Uncovering the City in the Suburb: Cold War Politics, Scientific Elites, and High-Tech Spaces.” In The New Suburban History, edited by Kevin M. Kruse and Thomas J. Sugrue. Chicago: University of Chicago Press. OCLC 62090790. Rowe, Jeff. 2006. “Habitat for Humanity Salvaging Building Materials at El Toro.” Orange County Register, August 10. http://www.ocregister.com/news/old-36671-habitat-buildings.html. Shipley, Robert, Steve Utz, and Michael Parsons. 2006. “Does Adaptive Reuse Pay? A Study of the Business of Building Renovation in Ontario, Canada.” International Journal of Heritage Studies 12: 505-520. OCLC 366072723. Stoler, Ann Laura. 2008. “Imperial Debris: Reflections on Ruins and Ruinations.” Cultural Anthropology 23: 191-219. OCLC 438095852. Brian Beaton is an Assistant Professor at the University of Pittsburgh’s School of Information Sciences. His research and teaching interests include science and technology studies (STS), archives, social and cultural theory, information workplaces, design, public and applied history, scholarly communication, digital humanities, and public policy.